Today I was excited to learn more about the work of Charles Kovach, Support Scientist with Global Science and Technology, a contractor to NOAA Center for Satellite Applications and Research (STAR). Charles’s work may sound familiar. It is a bit similar to the work I wrote about yesterday that Audrey and Kyle are doing with the University of Rhode Island. He wants to match what satellite pictures are seeing to what is really here in the ocean. Charles has another cool tool called a “hyperspectral profiler” or hyperpro for short. He can put this tool into the water to measure light at the surface, light coming down through the water, and light bouncing back up from the deep. He wants to know how the sunlight changes as it goes down into the deep and back up through the water. The hyperpro measures thousands of different colors as they travel through the water. Seeing what colors bounce back from the water can help you understand what is IN the water. For example, you can see some of this with your own eyes. Blue water is usually clean and clear, green water has a lot of algae, and brown water has a lot of particles like sand or dirt. But the hyperpro gets A LOT more detail than just our eyes. Me assisting with the hyperpro deployment. I had to read the computer program and alert Charles regarding the depth of the instrument. The main purpose of this is to understand what satellites are seeing. We can get images from satellites out in space, like a picture of the ocean. But the satellite is outside of our atmosphere so it is seeing light that has gone through a lot of air and gases as well as the ocean. So when scientists can measure the light in the ocean at the same time that the satellite is taking a picture, they can use MATH to find a relationship between what the satellite sees and what is really happening on Earth. In this way, Charles can calibrate (make more accurate) and validate (make sure it is right) the satellite images. This is helpful information for A LOT of people all over the world. Scientists are pretty good at collaborating because they know how important it is to share information with everyone so we can all be more aware of what is happening in our natural world. Charles collaborates with other countries and their satellites, as well as NOAA’s satellites. Charles also collaborates with other scientists on the ship and in NOAA’s laboratories. This way he can compare his light data to other measurements such as chlorophyll (remember? It’s from phytoplankton! ), turbidity, and even specific species of plankton. Then he can find relationships between things like the light and the plankton or turbidity. He can use MATH to write an equation for this relationship (we call that an algorithm). And you know what that means? We can use a satellite picture to tell what kind of plankton is in the water! We can see tiny plankton from space! WOW. When Charles uses his hyperpro, the machine automatically records the light data and we can see it on a computer screen. Then he uses special computer software to analyze the data to better understand what it means and how it relates to the satellite. He creates line graphs to understand the colors of light that are coming down into and up out of the water. Charles’s data after it’s been processed or analyzed. He ends up with line graphs, satellite images, and photos as scientific evidence. 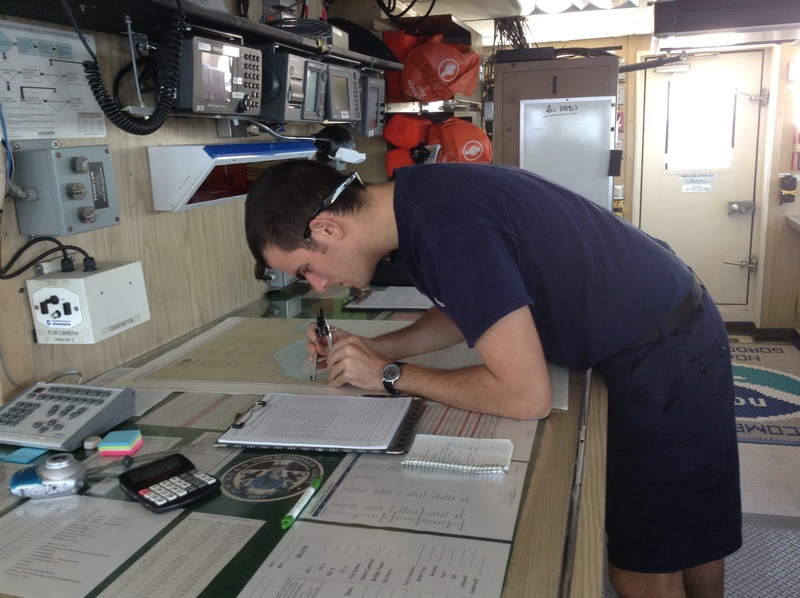 One thing I have noticed with all of the scientist on the ship is the importance of data collection! I have entered some of the data and have noticed data sheets around the wet lab. If we do not write or type every bit of data, then it can’t teach us anything. Scientists write data into a data table of columns and rows. This keeps it organized and easy to understand. When they analyze the data, they will often create a graph from the data table. This helps them to see a picture of relationships between the measurements. Me – How did you become interested in your field of study? Charles – I worked in Florida as a water quality manager. It became obvious that we needed to see the bigger picture to truly understand what was happening in the water. Satellites are the best way to try to get a picture of what is happening over a large space at the same time. Me – What would you recommend to a young person exploring ocean and science career options? Charles – Work hard in MATH! I use math every day and would not be able to do this work without it. It is very important! Computer coding is also important in the work I do. Charles surrounded by his work. Wow, I cannot believe how much I am learning during this experience. It is truly fascinating. In my past blogs, I mentioned spending some down time on the fly bridge. I wanted to share more about that part of the ship because it is a truly peaceful place and really allows you to feel that you are in the middle of the ocean! The fly bridge is the highest of the decks on the ship. It is above the “bridge deck” (where NOAA Corps operates the ship) and just under the radar sensors. At any given time during the day, you can find some of the science team and sometimes the NOAA Corps team up on the fly bridge. We might be checking with the seabird observers to see what animals have been spotted, taking a nap in the sun at the picnic table, staring out at the water with binoculars, or getting cozy with a good book. It’s a great place to soak it all in and my favorite place on the ship. One level below the fly bridge is the bridge deck where the ship is operated. NOAA Corps Officers are happy to answer questions and it’s also a fun and interesting place to visit. 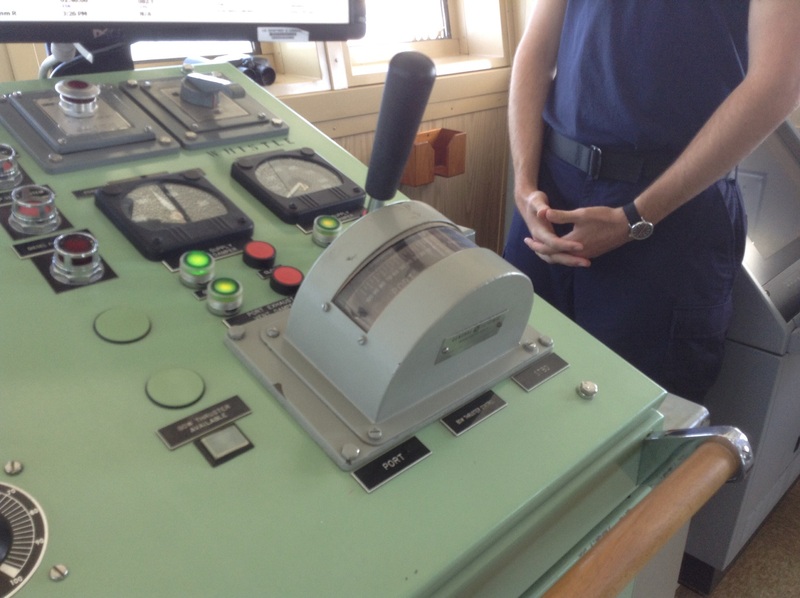 It’s a great place to see the charts that officers use to navigate, radar screens, and other cool ship operating tools. They even let me take control of the ship! JUST KIDDING! That would never happen, unless I trained to become an officer myself and was authorized to control the ship. Maybe one day! Me driving the ship. Just kidding. But I could pose for a photo just for fun. A mola mola at the surface. Photo courtesy of NOAA. Can you guess what this photo is? Add your guess to the comments below! The J-Frame is used to deploy equipment into the water. En route to our first oceanography station just past Nantucket, Electronics Technician Tony VanCampen and my fellow day watch scientist Leann Conlon gave me an overview on how each sampling is conducted. This is where the pieces of equipment I described in my previous blog post (bongo nets and CTD) come into play. Science is very much a team effort. I learned that a deck crew will be in charge of maneuvering the winch and the J-frame. Attached to the cable will be the bongo nets and the CTD which are carefully lowered into the ocean. Bongo nets allow scientists to strain plankton and other samples from the water using the bongo’s mesh net. At each station the bongo will be sent down to within 5 meters of the bottom or no more than 200 meters. After the bongo has reached its maximum depth for a particular station, the net is methodically brought back to the surface—all the while collecting plankton and sometimes other small organisms like tiny shrimp. It usually takes about 20 minutes for the bongo nets to be cast out and returned on board with the samples. Here I am in my gear preparing to launch the first bongo nets. Once the bongo nets have returned from the water to the aft (back) deck, our work begins. As a part of the Science Party, it is my job to rinse the entire sample into containers, place the plankton into jars, add formalin to jars that came from the big bongos and ethanol to jars that came from the small bongos. These substances help preserve the specimens for further analysis. At the conclusion of the cruise, our plankton samples will be sent to the Sea Fisheries Institute in Poland where scientists and lab crew sort and identify the plankton samples which gives NOAA scientist an idea of the marine environment in the areas in which we collected samples. Our Chief Scientist is David Richardson. 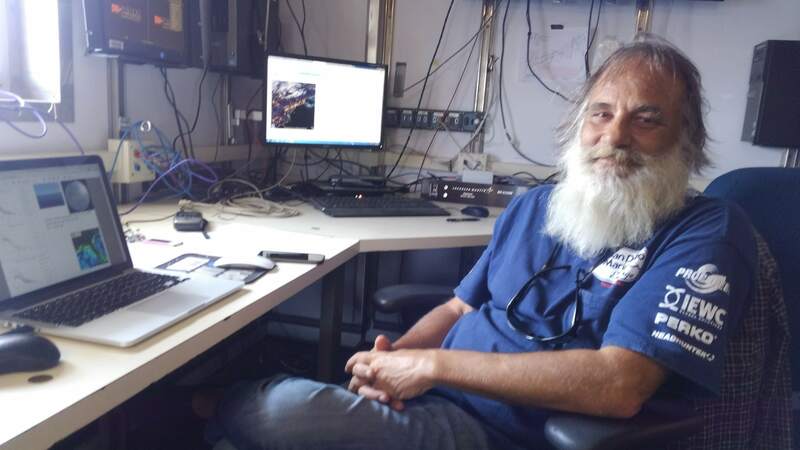 Dave has been with NOAA since 2008. He keeps track of the digits on the flowmeter (resembles a small propeller) inside the bongo. The beginning and ending numbers are input into the computer which factors in the ship’s towing speed to give us the total volume of water sampled and the distance the bongo net traveled. At various oceanography stations we perform a CTD cast which determines the conductivity, temperature, and depth of the ocean. 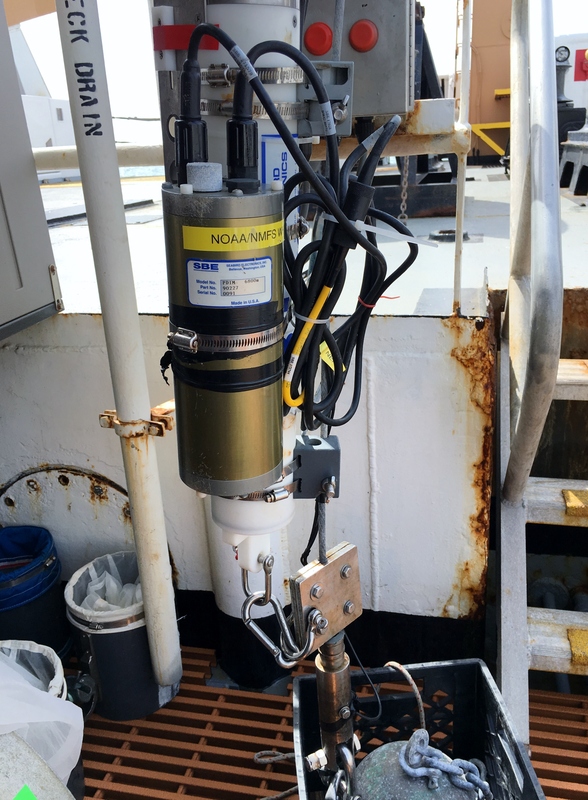 The CTD is attached to the bongo nets or the CTD is mounted within a frame, which also holds several bottles for sampling seawater along with a mechanism that allows scientists on board the ship to control when individual bottles are closed. 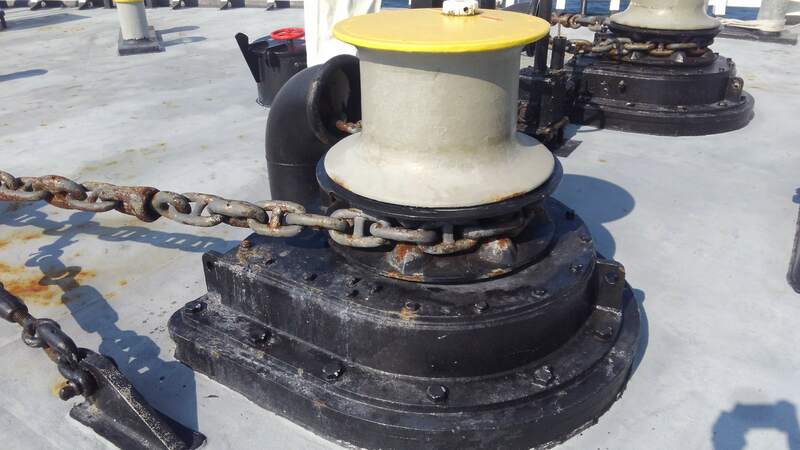 The CTD is connected to the ship by means of a conducting cable and data are sent electronically through this cable, in real-time, to the scientists on the ship. 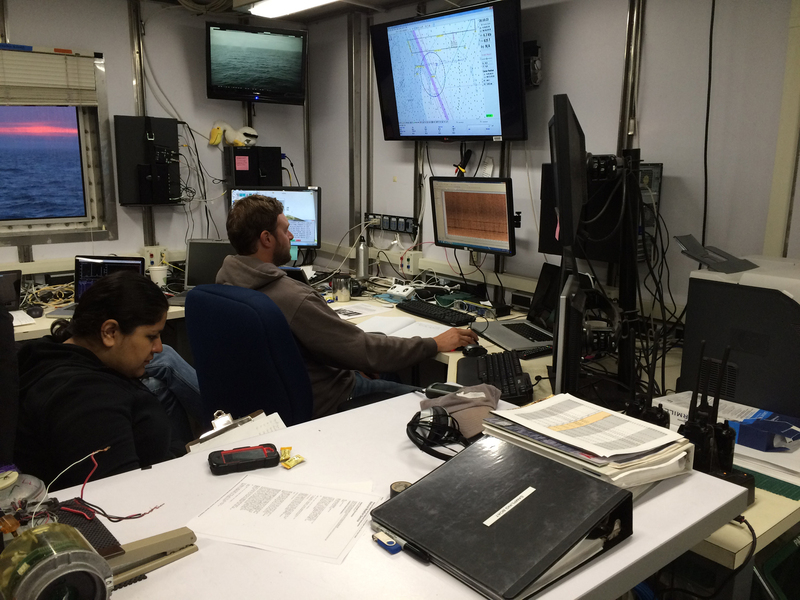 The scientists closely monitor the data, looking for temperature and particle anomalies that identify hydrothermal plumes. 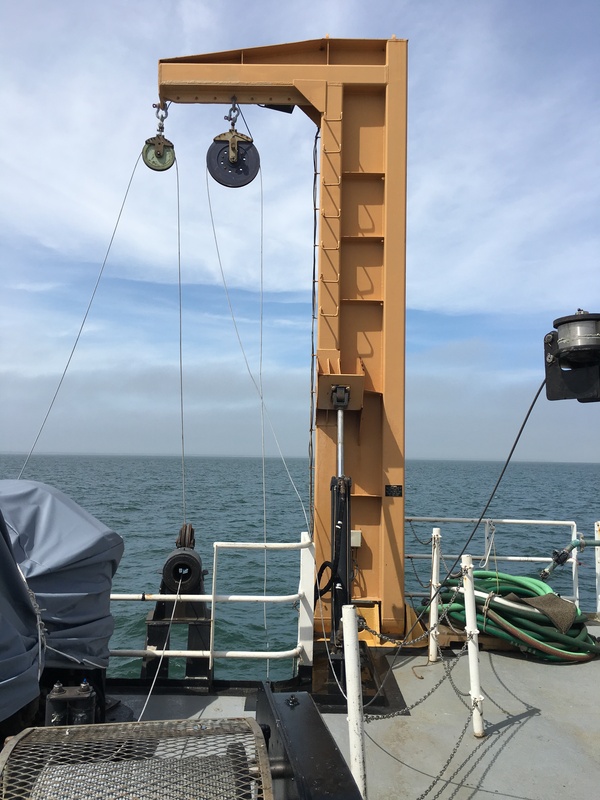 As the CTD is sinking to the desired depth (usually 5-10 meters from the bottom), the device measures the ocean’s density, chlorophyll presence, salinity (the amount of salt in the water), temperature, and several other variables. 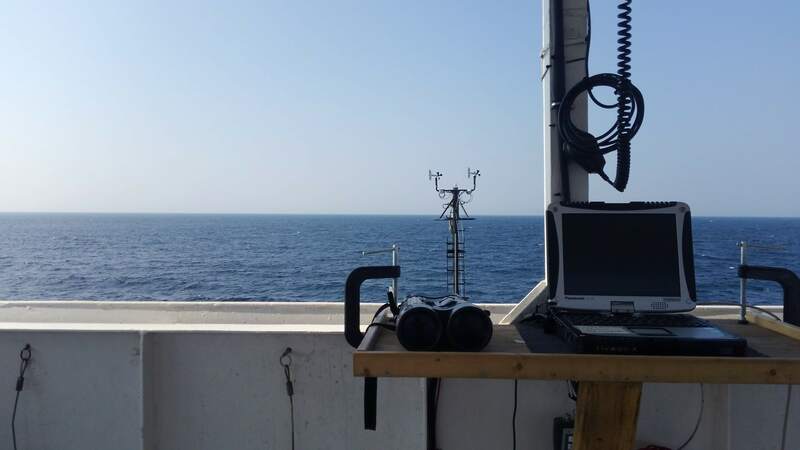 The CTD’s computer system is able to determine the depth of the water by measuring the atmospheric pressure as the device descends from the surface by a certain number of meters. There is a great deal scientists can learn from launching a CTD in the sea. The data tells us about dissolved inorganic carbon, ocean water nutrients, the levels of chlorophyll, and more. 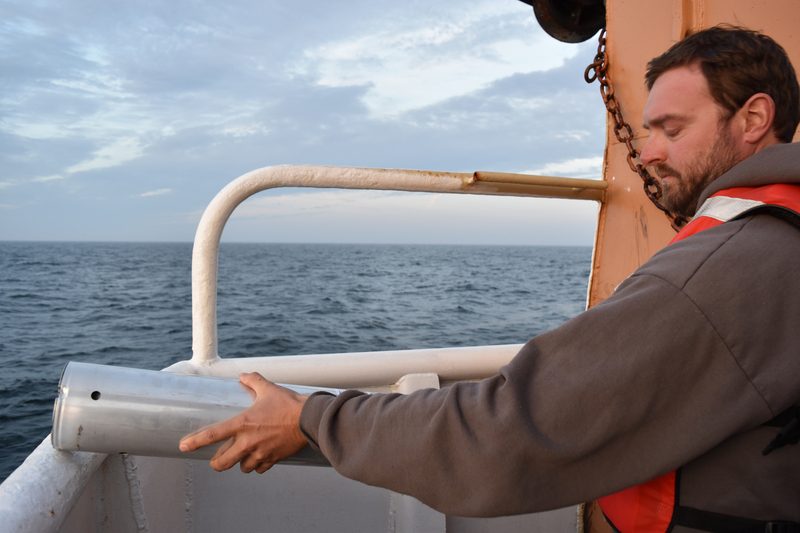 From the information gathered during CTD casts, researchers can investigate how factors of the ocean are related as well as the variation of organisms that live in the ocean. The highlighted lines are stations completed in the first leg. The circle indicates the stations for my leg of the survey. 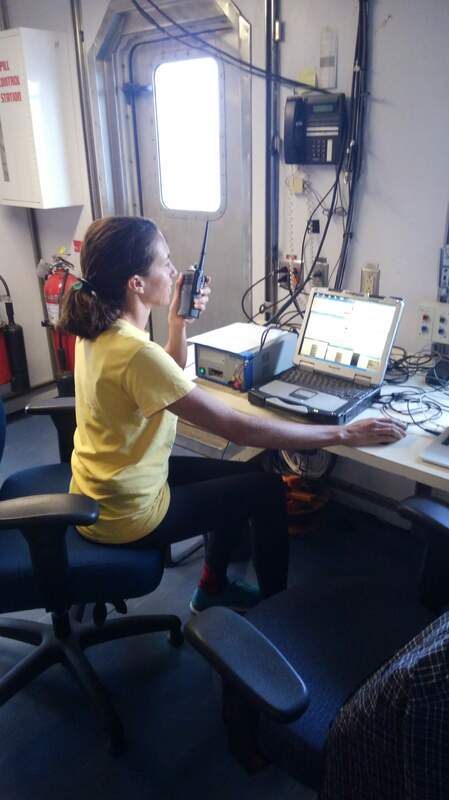 It is fascinating to see the communication between the scientists and the NOAA Corps crew who operate the ship. 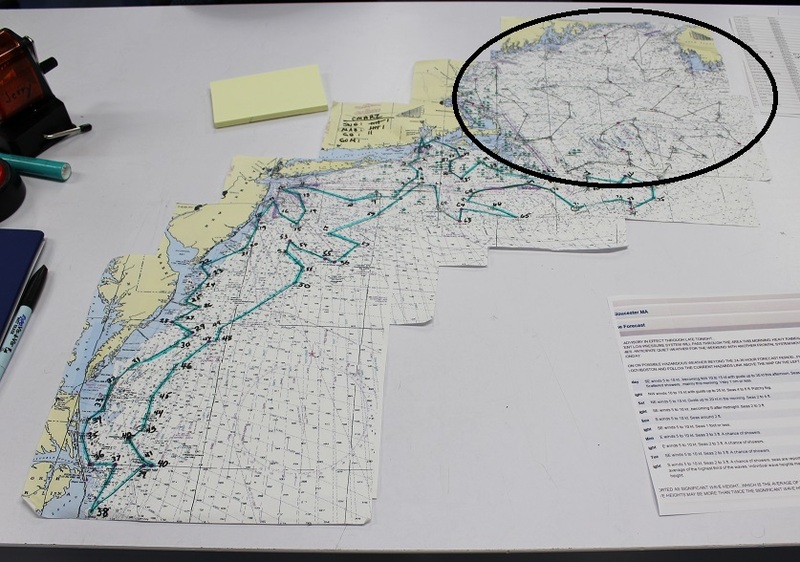 For instance, NOAA officers inform the scientists about the expected time of arrival for each station and scientists will often call the bridge to inquire about Gordon Gunter’s current speed and the weather conditions. 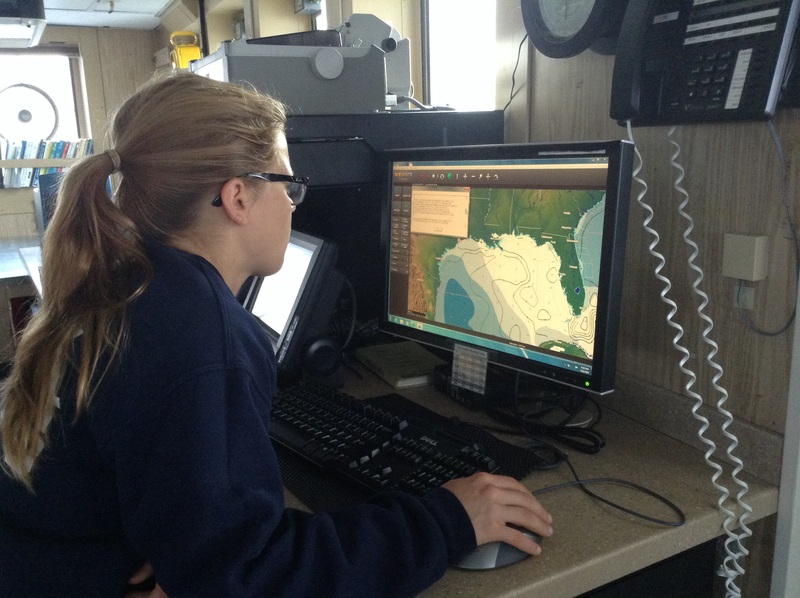 Even computer programs are connected and shared between NOAA Corps crew and the scientists. 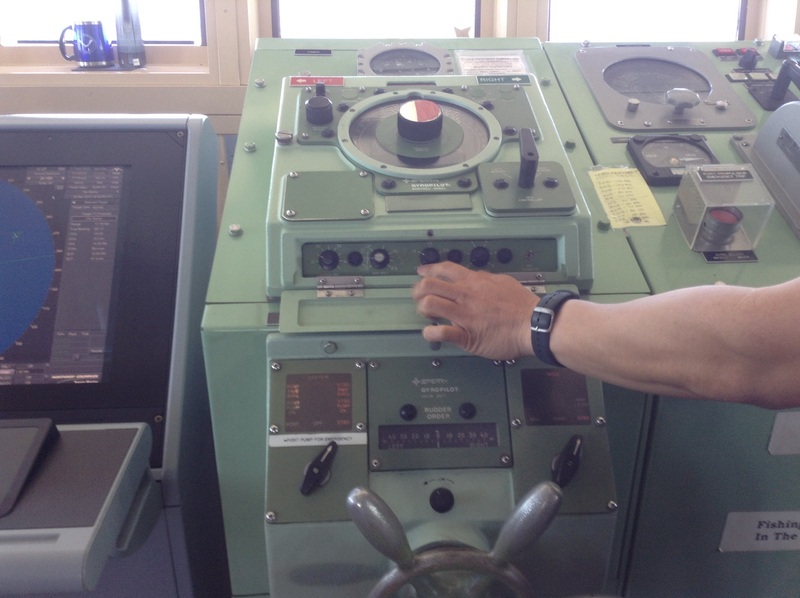 There is a navigation chart on the monitor in the bridge which is also displayed in the science lab so everyone knows exactly where we are and how close we are to the next station. The bridge must always approve the deployments and recovery of all equipment. There are closed circuit video cameras in various places around the ship that can be viewed on any of the monitors. The scientists and crew can see everything that is going on as equipment gets deployed over the side. Everyone on Gordon Gunter is very much in sync. Today, my shift began at 12 noon. 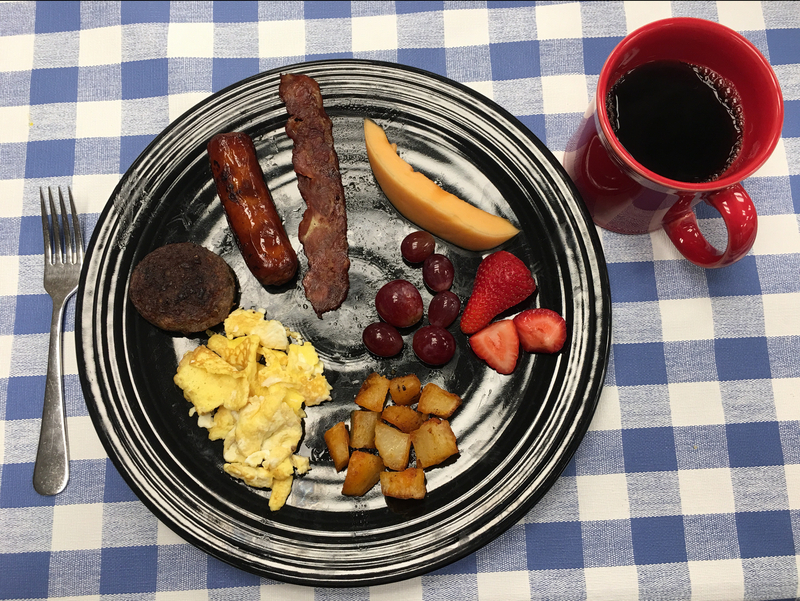 It probably was not the best idea to have awakened at 6:00 a.m., but I am not yet adjusted to my new work schedule and I did not want to miss one of Margaret’s hearty breakfasts. We cast out from the Naval Station Newport mid-morning. It was a clearer and warmer day compared to the day before—perfect for capturing pictures of the scenic harbor. I spent much of the morning videoing, photographing, and listening to the sounds of waves as they moved around the ship. I like to spend a lot of time on the bow as well as the flying bridge (the area at the top of the ship above the bridge where the captain operates the vessel). Before lunch, I was beginning to feel a little sea sick from the gentle swaying of the ship. I could only hope that I would find my sea legs during my first watch. 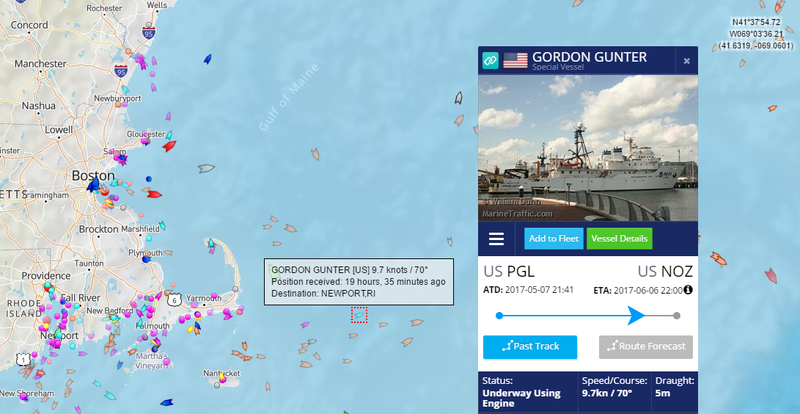 Gordon Gunter gracefully made its way alongside Martha’s Vineyard and Nantucket—two islands off the coast of Cape Cod. 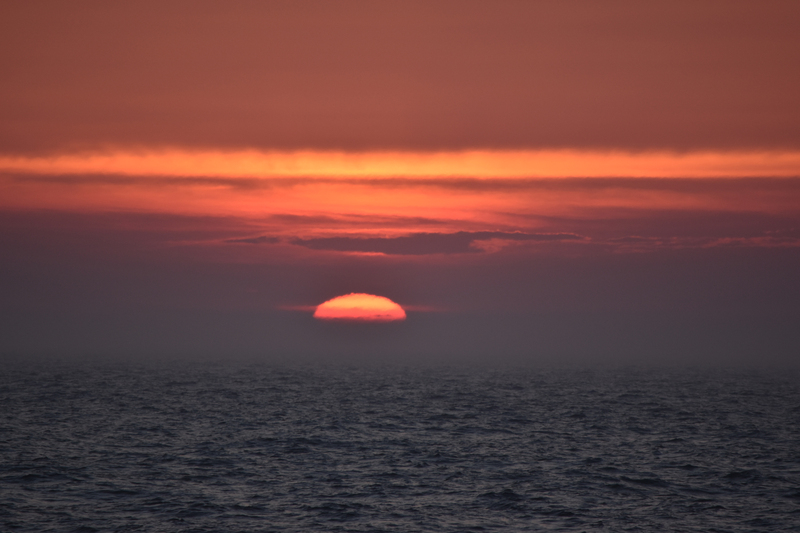 Standing on the flying bridge and looking out at the horizon alleviated my sea sickness. At this position I was able to observe and photograph an abundance of wildlife. Seeing the sea birds in their natural habitat is a reminder that I am just a visitor on this vast ocean which so many animals call home. Watching birds fly seamlessly above the waves and rest atop the water gives me a yearning to discover all I can about this unique ecosystem and ways in which we can protect it. Scroll around the video to see the view from the ship’s bow in all 360-degrees. The phrase, “to find one’s sea legs” has a meaning much deeper than freedom from seasickness. Finding your sea legs is the ability to adjust to a new situation or difficult conditions. 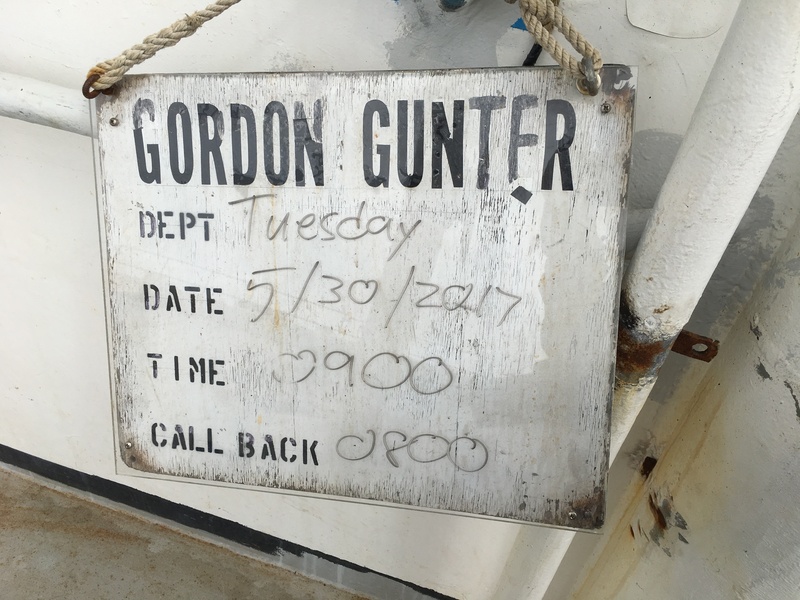 Everything on board Gordon Gunter was new and sometimes difficult for me. 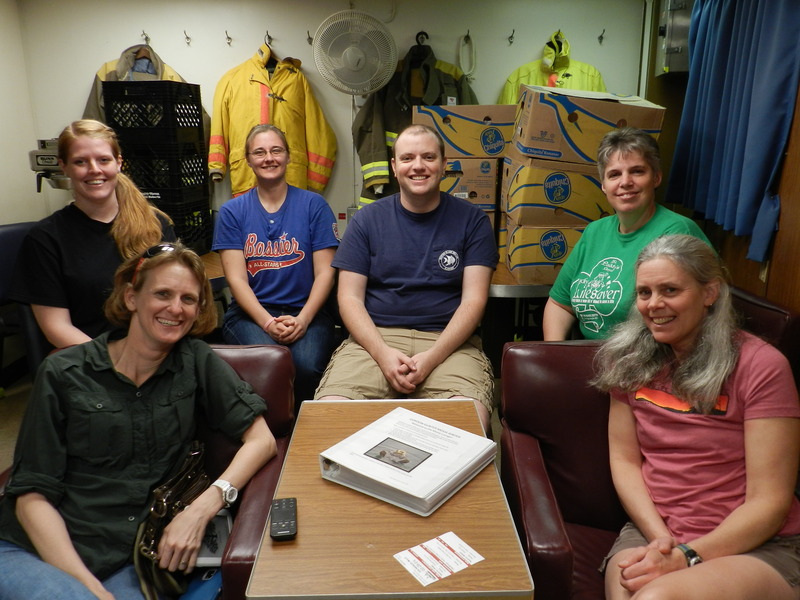 Luckily, I have help from the best group of scientists and NOAA Corps crew a Teacher at Sea could ask for. At 8:00 p.m. 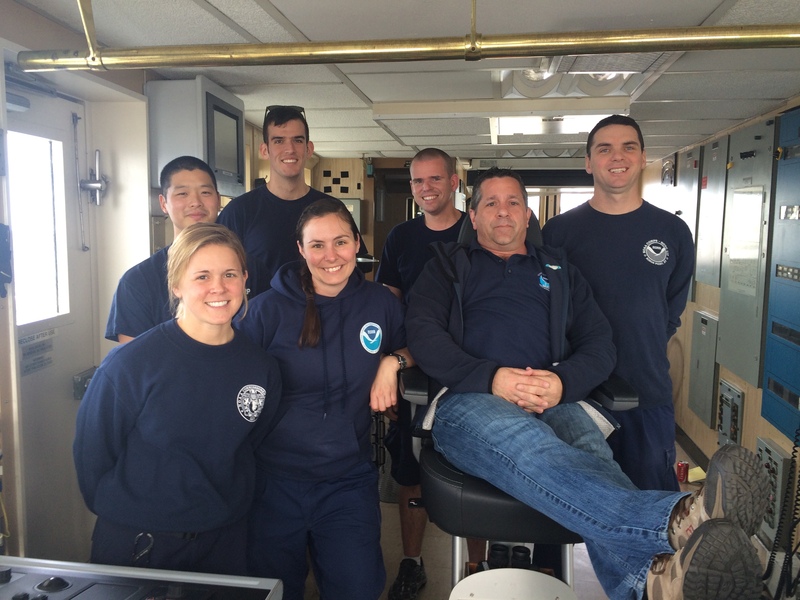 I was part of the leg’s first oceanography station operation. I watched closely as the bongo nets were tied tightly at the end then raised into the air by the winch and J-Frame for deployments into the sea. While the bongo nets and CTD were sinking port side, I looked out at the horizon and much to my amazement, saw two humpback whales surfacing to the water. The mist from their blows lingered even after they descended into the water’s depths. Once the bongo nets where recovered from the ocean, the crew and I worked quickly but with poise. We used a hose to spray the nets so that all the plankton would reach the bottom of the net when we dumped them into a container. I observed fellow scientist Leann pour each bongo’s sample into a jar, which she filled with water and then a small portion of formalin to preserve the samples. It began and was over so quickly that what took about an hour felt like ten minutes. An hour later we reached our second station, and this time I was ready! Instead of mostly observing as I did during the first time, this time I was an active participant. Yes, I have a lot left to learn, but after my first day at sea and three stations under my belt, I feel like my sea legs are growing stronger. Scroll around the 360-degree video to see the Science Party retrieve samples from bongo nets. I am not yet used to working until midnight. After all, the school where I teach dismisses students by 3:30 p.m. when the sun is still shining. Not to worry, I will adjust. It is actually exciting having a new schedule. I get to experience deploying the CTD and bongo nets during day light hours and a night time. The ocean is as mysterious as it is wide no matter the time of day. You never quite know what the weather is going to be from one day to the next out at sea. Since my arrival at the ship in Newport, Rhode Island I have experiences overcast skies, sunshine, rain, and now dense fog. But that’s not all! The forecast expects a cold front will approach from the northwest Friday. Today’s fog made it difficult for the animal observers to spot many birds of whales in the area. Despite low visibility, there is still a lot to do on the ship. After our first bongo station in the early afternoon, we had a fire and abandon ship drills. Carrying out of these drills make all passengers acquainted with various procedures to be followed during emergency situations. I thoroughly enjoy doing the work at each station. Our sampling is interesting, meaningful, and keeps my mind off being sea sick. So far, I am doing much better than expected. The excitement generated by the science team is contagious. 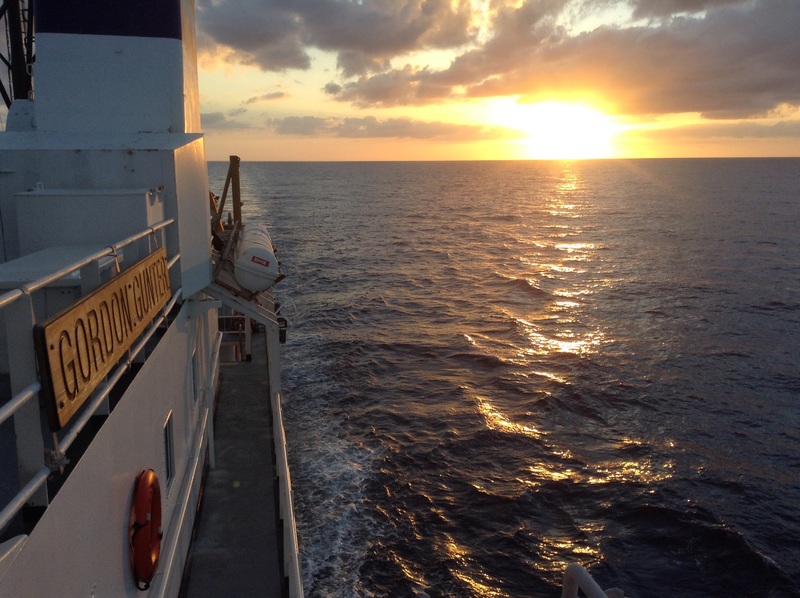 I now long for the ship to reach each oceanography station so I can help with the research. Approximate position of our last station on May 31 in Georges Bank. So far the animals seen have been mostly birds. 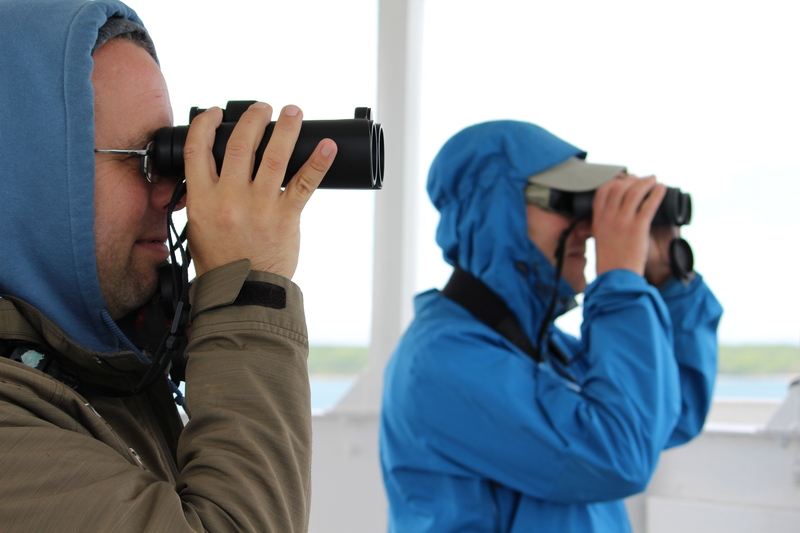 I am grateful to the mammal and seabird observers, Glen Davis and Nicholas Metheny. These two are experts in their field and can ID a bird from a kilometer away with long distance viewing binoculars. Glen and Nicholas on the lookout. Barometer: an instrument for determining the pressure of the atmosphere and hence for assisting in forecasting weather and for determining altitude. Altimeter: an instrument for measuring altitude; especially an aneroid barometer designed to register changes in atmospheric pressure accompanying changes in altitude. Flowmeter: an instrument for measuring one or more properties (such as velocity or pressure) of a flow (as of a liquid in a pipe). Salinity: consisting of or containing salt. Conductivity: the quality or power of conducting or transmitting. 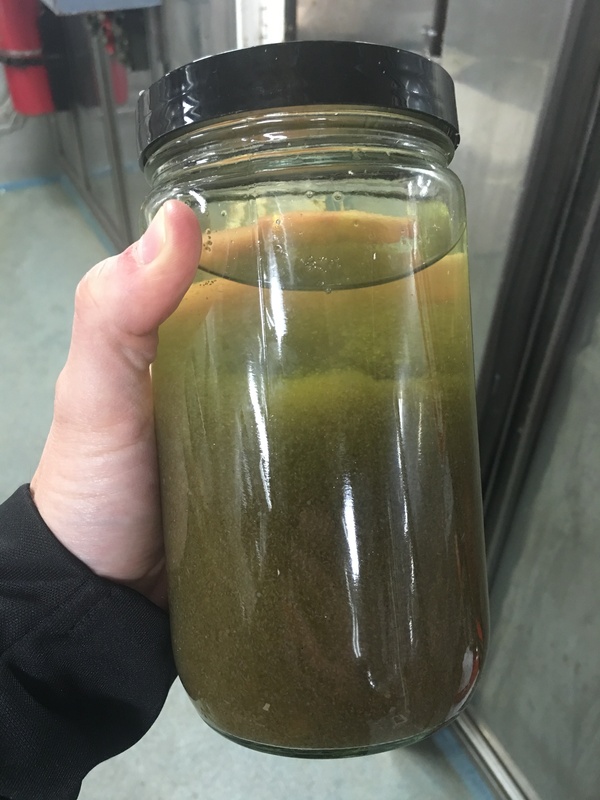 Chlorophyll Maximum: a subsurface maximum in the concentration of chlorophyll in the ocean or a lake which is where you usually find an abundance of phytoplankton. Formalin: a clear, water like solution of formaldehyde and methanol used especially as a preservative. The average depth of the ocean is about 12,100 feet. The deepest part of the ocean is called the Challenger Deep and is located beneath the western Pacific Ocean in the southern end of the Mariana Trench. Challenger Deep is approximately 36,200 feet deep. It is named after the HMS Challenger, whose crew first sounded the depths of the trench in 1875. [Source — NOAA Official Website]. The sounds marine mammals make are often used to study them. Dolphins make clicks and whistles whereas humpback whales mostly sing. North Atlantic right whales also make sounds with their signature sound being described as an up-call, a rising whoop that lasts for about a second. Sei whales, on the other hand make a down-call, a sinking whoop. Right whales also make a variety of other sounds including: 1) eerie moans, 2) shrill screams which often occur when gathered in groups, and 3) a gunshot sound that sounds like a very loud pop and is thought to be an aggressive call towards males. These sounds are not easily heard, but can be observed on a sound spectrogram. A sound spectrogram is a graph of frequency (the number of cycles in a second, given as hertz) on the vertical axis and time on the horizontal axis. Right whale up-calls range in the low hertz levels of 100-300 hertz, while dolphins are much higher in pitch. The darker the call on the spectrogram, the louder the call is. To listen to a variety of right whale calls go to the Right Whale Listening Network for examples. Right whale up-call on a spectrogram posted on the Northeast Fisheries Protected Species Branch website. Go to link to actually hear the call of a right whale and several other whale species. Close up of a right whale up-call on a spectrogram. Image from the Right Whale Listening Network. Whale acoustics can be recorded by a variety of methods. On this cruise we are using two methods: sonobuoys deployed from the ship and autonomous acoustic technology (aka “gliders”). Let’s talk about sonobuoys first. 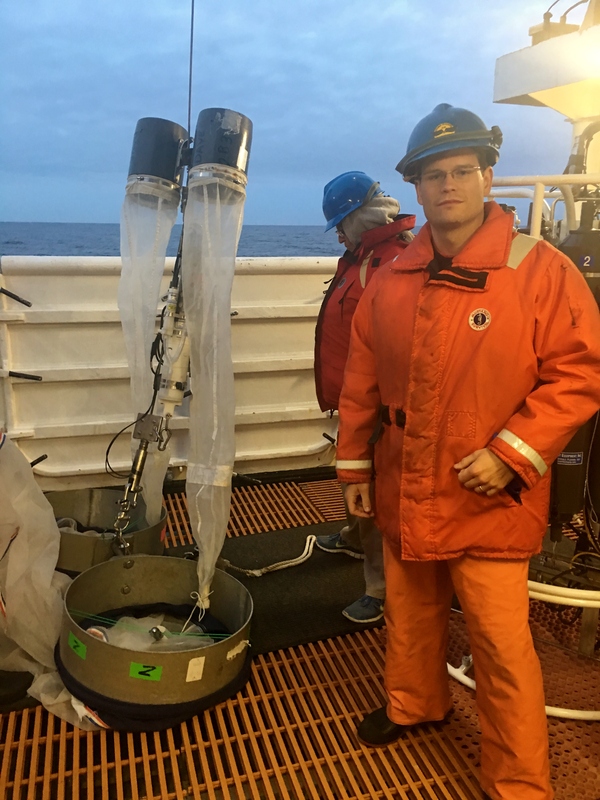 The sonobuoys used on this cruise were first designed for the military but have found a second use in scientific research. They are housed in an aluminum tube about a meter in length and 10 centimeters in diameter. When the tube hits salt water it starts a chain reaction starting with deployment of the bright orange float. The sonobouy, with hydrophones, then bobs freely in the ocean and sends radio signals to an antenna high on the ship’s mast. The signal is then captured by a computer and a spectrogram of the sound is displayed and recorded. The sonobuoy has about an eight hour life span and a five mile range. 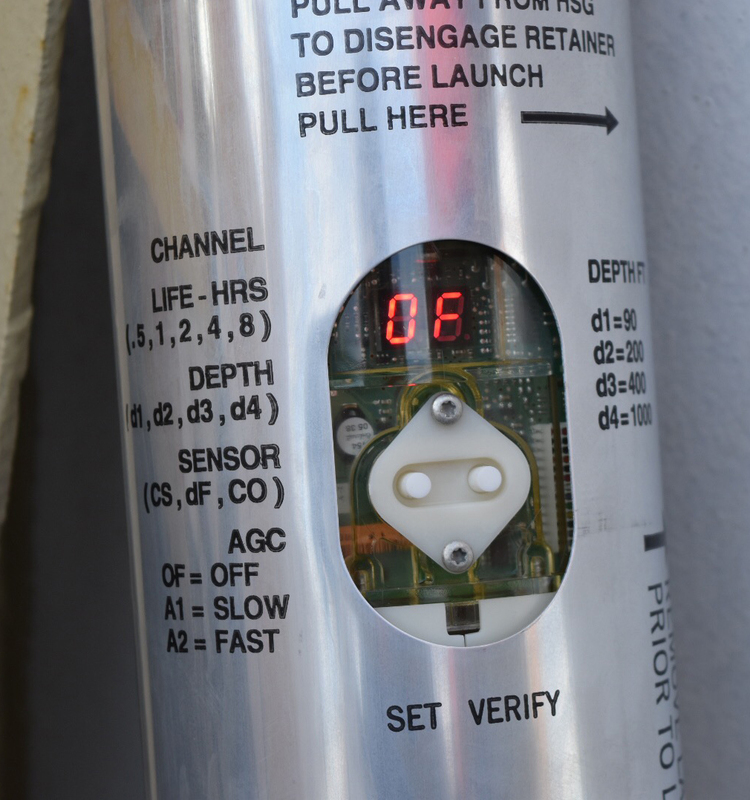 Close up of the electronics panel of a sonobuoy. 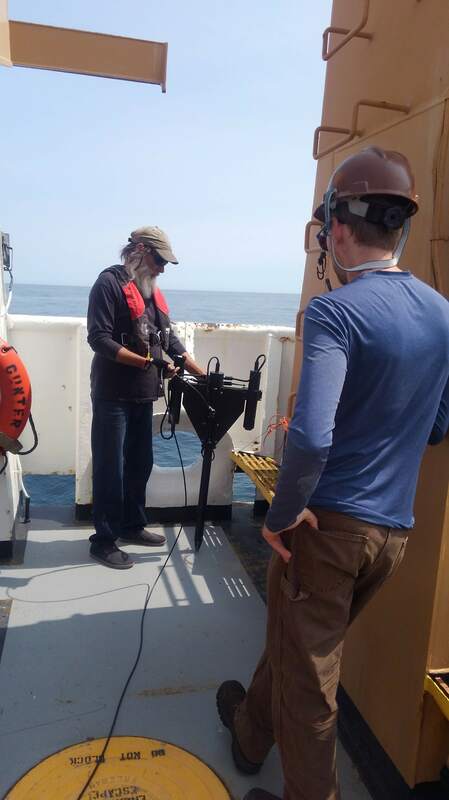 Chris Tremblay, from the Northeast Fisheries Science Center, Passive Acoustic Group, deploying a sonobuoy to listen for sei whales off the stern of the Gordon Gunter. 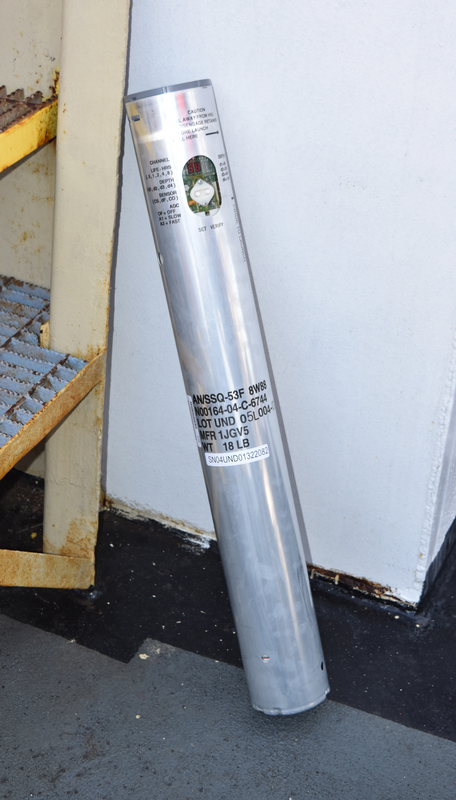 A defunct sonobuoy out of the aluminum case. 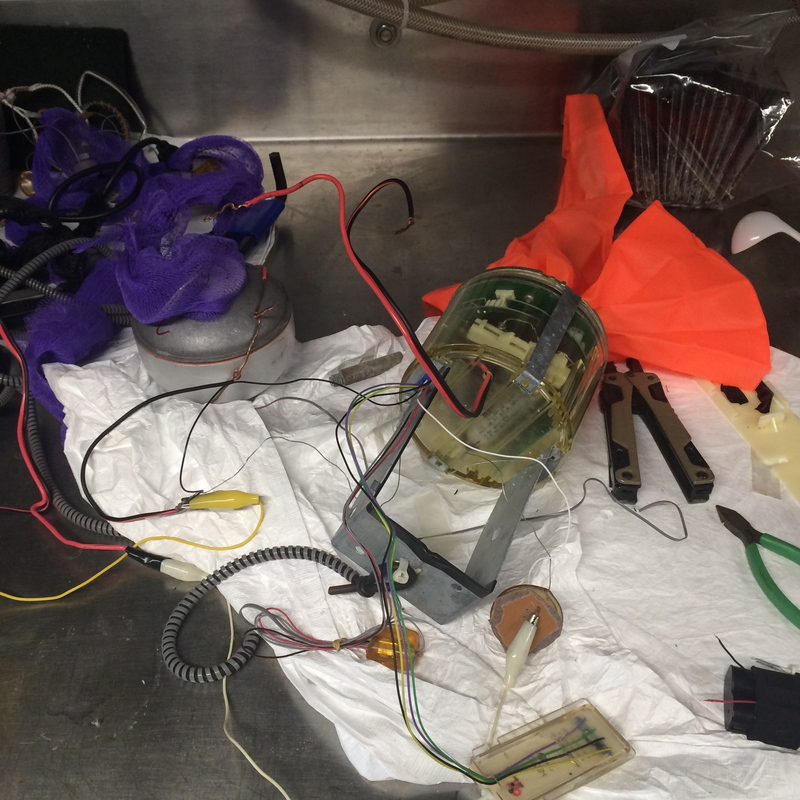 You can see the orange float, and the round hydrophone (in the upper left corner) attached to the purple netting. 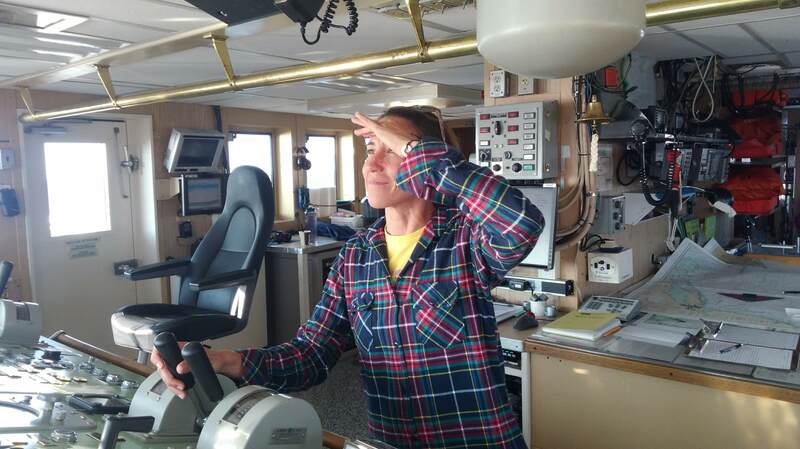 Chris Tremblay analyzing the signal coming from the sonobuoy that was deployed. 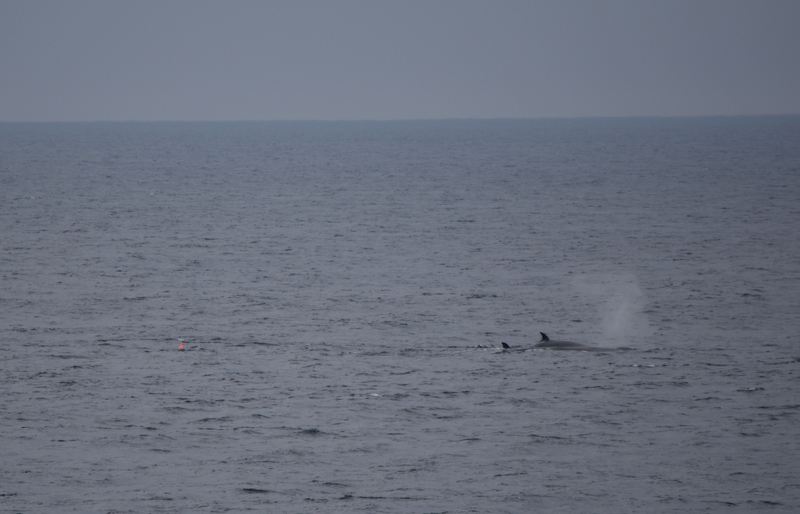 Two sei whales with orange float of the sonobuoy located to the left of the whales. There are some limits to sonobuoys, namely the five mile (or more depending on model and antenna location) range. 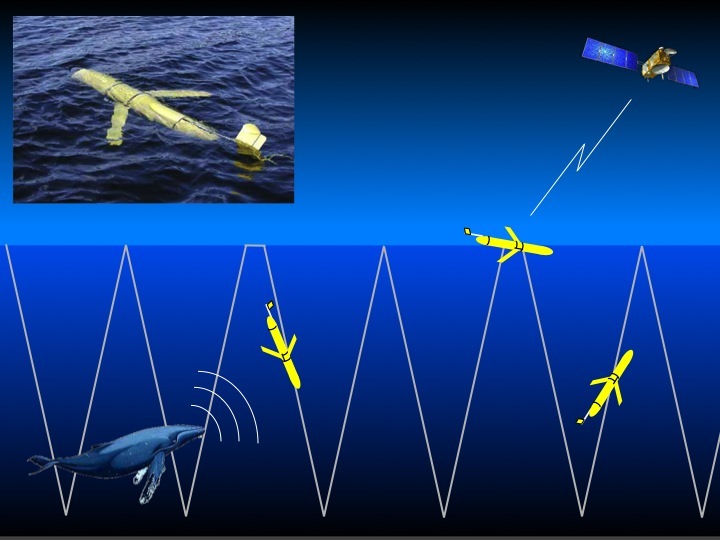 Doctors Baumgartner and Fratantoni at the Woods Hole Oceanographic Institution (WHOI) have developed a means of retrieving real-time detection of whale acoustics from autonomous acoustic gliders. The particular glider used in the Great South Channel is a Slocum glider. It looks a bit like a torpedo. It is programmed to follow a specific track and come to the surface every two hours to send data. The two researchers also developed a computer program that detects, classifies and reports interesting marine mammal calls otherwise the amount of data coming in would be completely overwhelming. 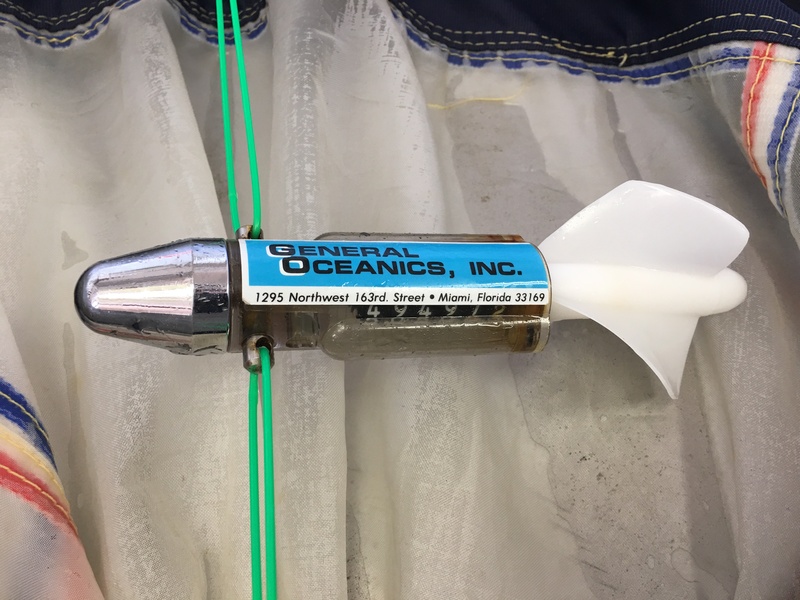 The Slocum glider also measures fluorescence and other oceanographic conditions, similar to the CTD. View of the Slocum glider underwater. 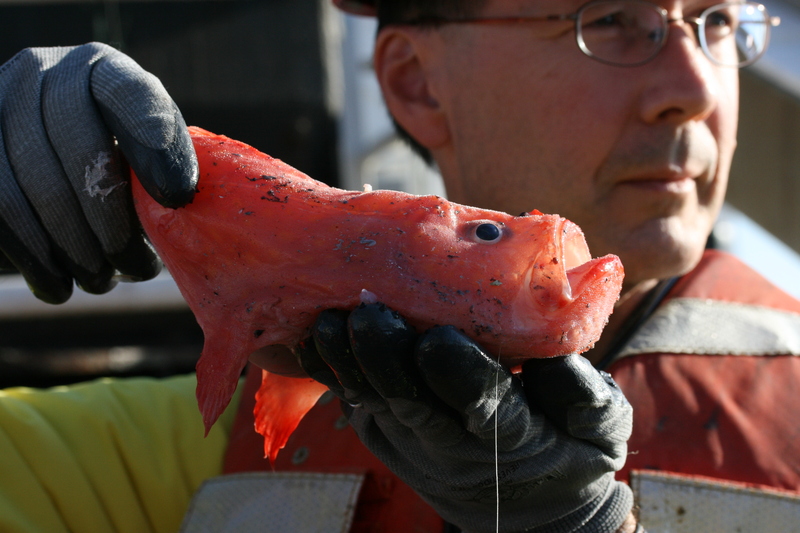 Photo from NE Fisheries, Protected Species Branch (Dave Fratantoni, WHOI). Today is the last full day on the ship and it is bittersweet. I have had a wonderful time and will be sad to go (but also glad to get home). I have learned so much about whales and the ocean. I have met some absolutely wonderful people, both scientists and crew. I am very grateful to all for incorporating me into their family. I would love to do this again next year. NOAA Corps on this cruise. Back row: Operations Officer Ensign David Wang, Junior Officer Ensign Pete Gleichauf, Executive Officer Lieutenant Commander Colin Little, Augmenting Officer Lieutenant Junior Grade P.J. Klavon. Front row: Navigation Officer Ensign Kristin Johns, Junior Officer Ensign Melissa Mathes, Commanding Officer Captain Donn Pratt. 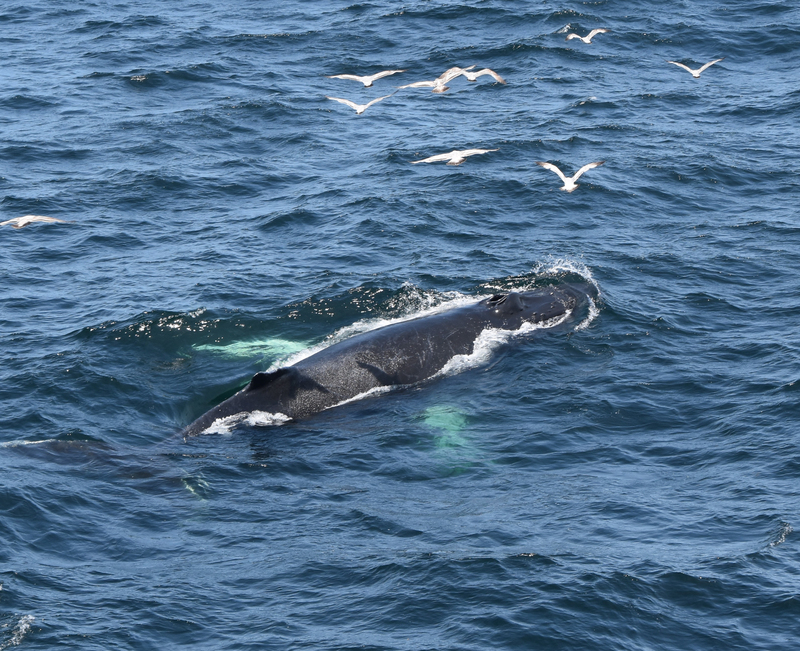 Even though we did not see the as many of the right whales that we wanted to, we did see several species including: humpbacks, sei whales, fin whales, minke whales, and Pete saw a sperm whale. 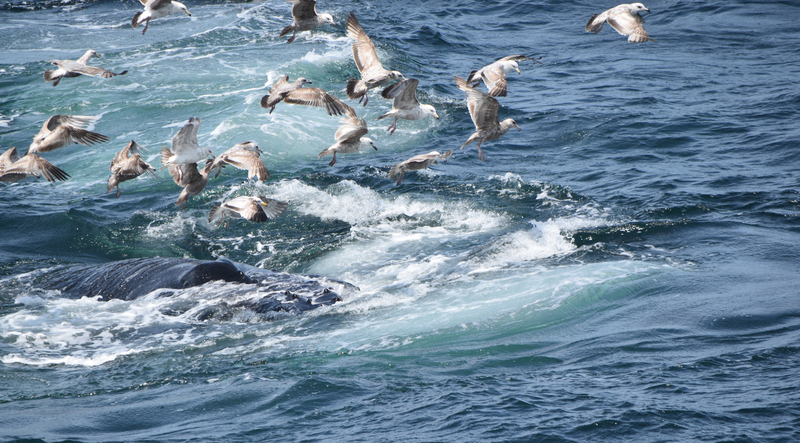 Yesterday (June 4th) we were deploying plankton nets encircled by a few dozen feeding humpback whales. It was a spectacular show. Humback whale feeding. Images collected under MMPA research permit #17355. Two humpbacks. Images collected under MMPA research permit #17355. Humpback feeding. Images collected under MMPA research permit #17355. Humpback. Images collected under MMPA research permit #17355. And I will end with a sunset photograph. Well, as you can see we are not quite on the ship yet. Today is the day, though. 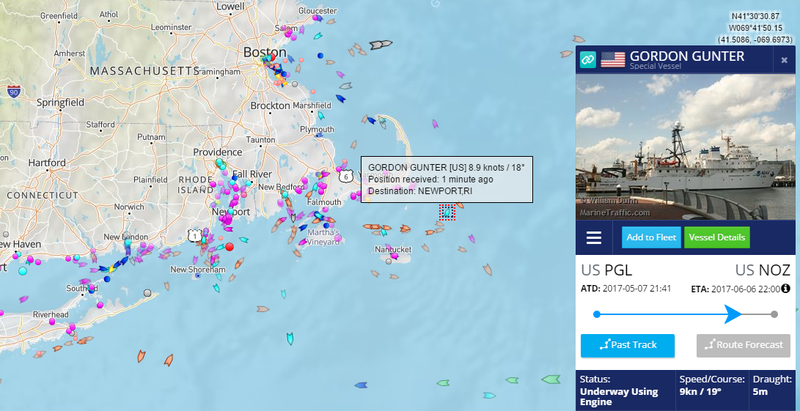 We are heading from Woods Hole, MA to Newport, RI to get on the Gordon Gunter and we are to set sail at 5 pm or 17:00. On Wednesday, I traveled to Newport and the Gordon Gunter with one of the scientists, a marine mammal specialist named Suzanne Yin (she goes by Yin). She was extremely helpful in making the shuttle to Newport and the Taxi to get onto the Navy base where the Gordon Gunter is docked. Once there we met up with many of the other scientists and helped to unload all of the scientific equipment and two small boats that will be deployed off the stern. Antennas were installed for acoustic work and the science labs were organized. I got to meet many of the scientists who will be on board and some that are not travelling. The project involves personnel from NOAA Fisheries and from Woods Hole Oceanographic Institute (WHOI). There are full time workers, contractors, and student interns. All of them are extremely nice and welcoming. After loading the ship and getting a bit organized it was determined that the ship would not make a good place to stay until Friday. One of the scientists, Chris Tremblay offered up a guest room and I headed back with them to Woods Hole. Yesterday (Thursday, May 14th) while everyone continued getting ready, I headed on the ferry to Martha’s Vineyard where I rented a car and drove around the island. 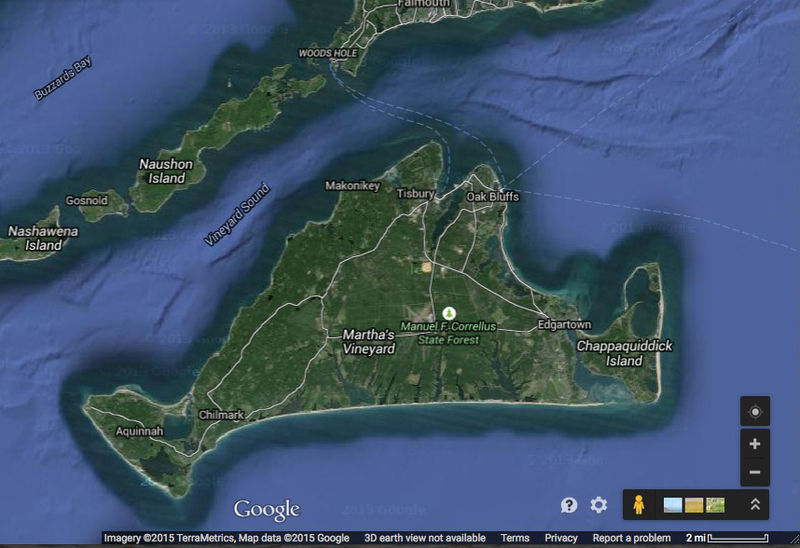 Martha’s Vineyard is actually composed of two islands to the south of Cape Cod. The island, similar to Cape Cod is the remnant of glaciers. The island marks the location of a terminal moraine and consists of sediment that was pushed there by glaciers and then left behind as the glaciers receded. It is an island now as sea level increased and separated this part of the moraine from other parts. The island is covered in glacial erratics, large rocks left behind by the receding glaciers. Many of these smaller rocks have been turned into rock walls all over the island. An interesting geologic feature of the island is Gays Head Cliffs. 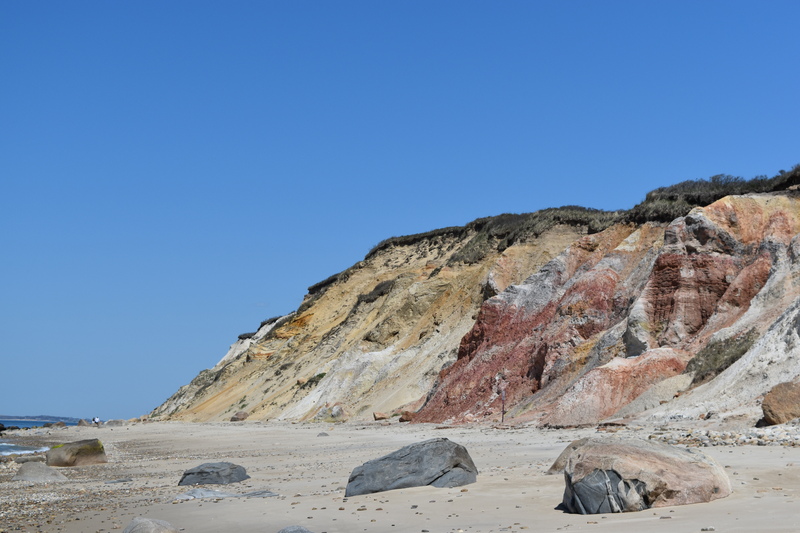 The cliffs are also referred to as the Aquinnah Cliffs and they are located on the western most edge of the island. The Gay Head Cliffs are composed of series of white, grey, red, and black clays that are Cretaceous in age (about 75 million years old). These beds once formed the coastal plain of North America but were pushed upwards by the moving glaciers to form part of the moraine. The top of the cliffs are composed of glacial deposits, including boulders, some of which have tumbled down to the beach. A viewpoint above and a walk on the beach provided a really nice view of the cliffs. The Gay Head Cliffs, located on the western edge of the island. I continued my tour around Martha’s Vineyard by heading east to Edgartown and the Katama Beach. I walked for a while on the beach trying to see the spit, but had to give up in the interest of time. Still, the beach was very spectacular especially since I seemed to have it all to myself. I found all sorts of seashells and dead crabs along my walk. The beach itself is bordered by vegetated sand dunes. 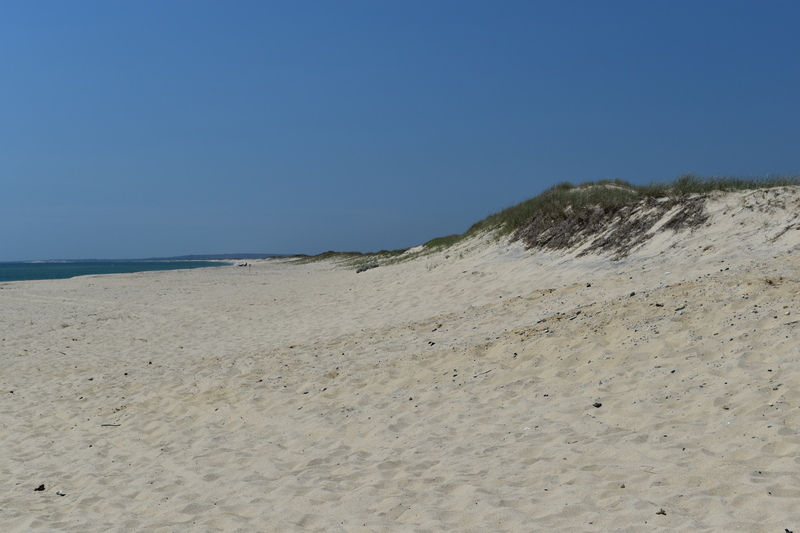 Katama Beach, located to the south of Edgartown on the eastern side of the island. The beach is bordered by vegetated sand dunes. From Edgartown, I headed north to Oak Bluffs to see some unique architecture including The Gingerbread Cottages, a colony of more than 300 small, unique decorated homes around a central park. This area started out as a Methodist meeting place with families setting up tents around a central park in the late 1800’s. Over the years, the tents were built on platforms and then the platforms had porches, and then they became these small, elaborate cottages. They are very cute, but I am not sure I would want to take on the task of repainting one. 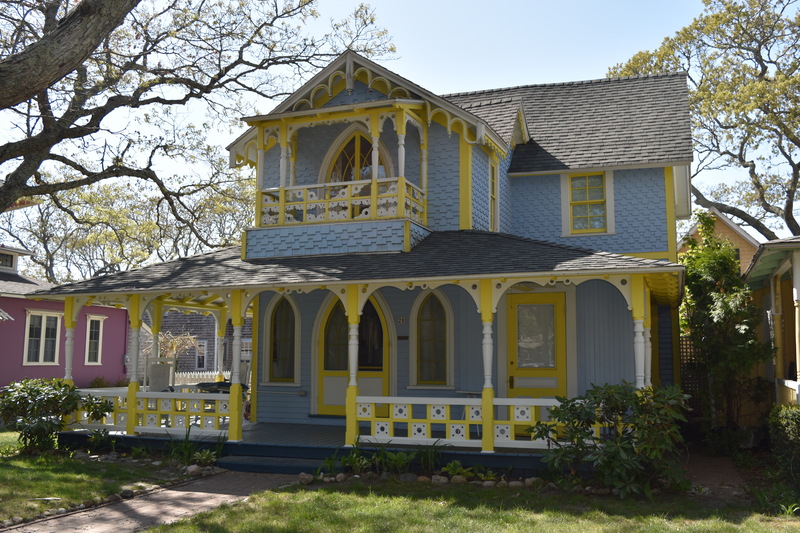 One of the Gingerbread Cottages in Oak Bluffs. From Oak Bluffs I returned to Vineyard Haven to return my rental car and to board the ferry for Woods Hole. I had a wonderful day touring Martha’s Vineyard. Hello from South Dakota! My name is Kelly Dilliard and I am a college professor at Wayne State College (WSC) in Wayne, NE. Wayne State College is one of three schools with the Nebraska State College System and it is located in northeast Nebraska. I actually live in Vermillion, South Dakota, due north of Wayne and commute to school every day. My husband, Mark Sweeney, is an Earth Science Professor at the University of South Dakota in Vermillion. We are located about 45 minutes northwest from Sioux City, Iowa and about an hour south of South Falls, South Dakota. Map of eastern Nebraska and parts of Iowa and South Dakota showing locations of where I am coming from. 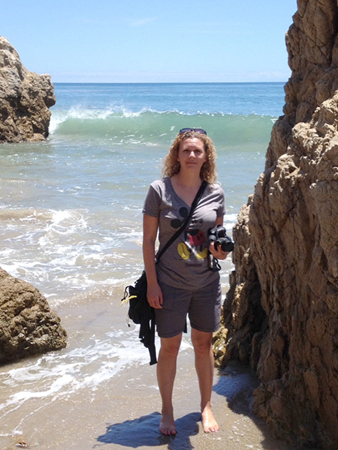 Me at a cove beach near Malibu, California in July of 2014. Taking lots of photographs and videos to use in my teaching. I teach all sorts of Earth Science courses at WSC including Introduction to Geology, Environmental Geology, Historical Geology, Rocks and Minerals, Oceanography, and Introduction to Meteorology. I try to create a hands-on experience for my students, but teaching in Nebraska has its drawbacks. We are far from some of the best geology sites and from the ocean, so instead of taking my students to the rocks or the ocean, I try to bring the rocks to my students in the form of specimens, photographs, and videos. I believe that my students benefit from exposure to these samples and from the experiences that I bring into the classroom. I hope this experience out at sea will help me bring more of the ocean to them. As I teach mostly to future science teachers, I also hope this experience will open them up to taking similar opportunities to gain useful experiences to use in their own classroom. 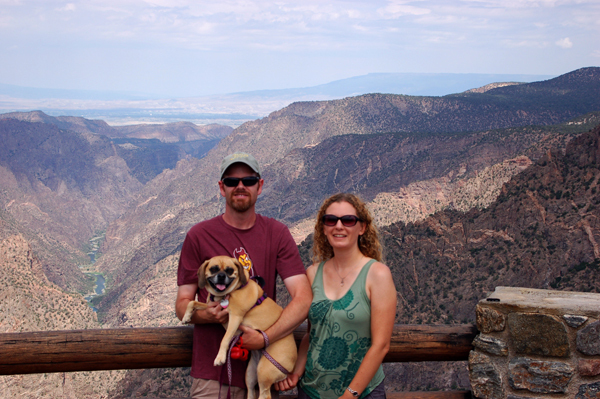 My husband, Mark, myself, and our puggle, Penny Lane, at Black Canyon of the Gunnison National Park, Colorado, July of 2014. As a youngster I had an interest in two sciences… geology and oceanography. I spent time in Hawaii when I was in fourth grade and fell in love with volcanoes and humpback whales. When it came to deciding on a major in college, I decided on geology and I have been actively engaged in researching and teaching about the Earth for the past 20 years. I am originally from eastern Pennsylvania, but through my graduate and professional career have lived in various states across the United States. I have three degrees in Geology, including a PhD from Washington State University. 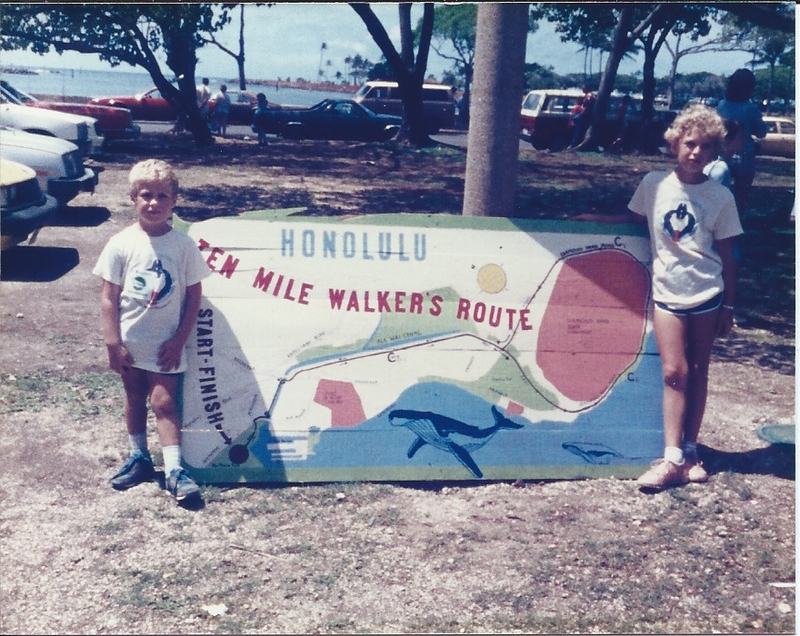 My brother and I in April of 1986 standing by the map of the “Save the Whales” walk we took part in. While I have an interest in oceanography and teach an oceanography class, I have never actually taken a formal oceanography course. 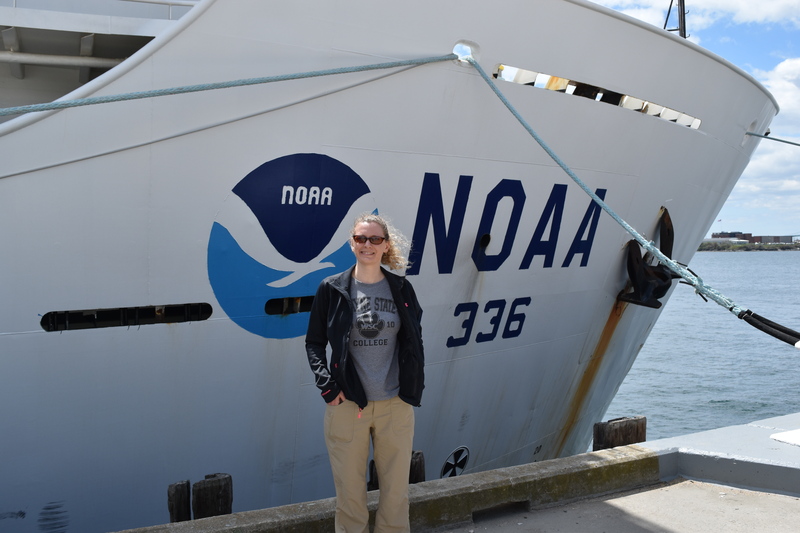 I applied to the NOAA (National Oceanic and Atmospheric Administration) Teacher at Sea (TAS) program to gain some ocean research experience and to bring that experience back into my classroom. The Teacher at Sea program is celebrating it’s 25th Anniversary this year and is, as I am finding out, a wonderful program (link to TAS program)! 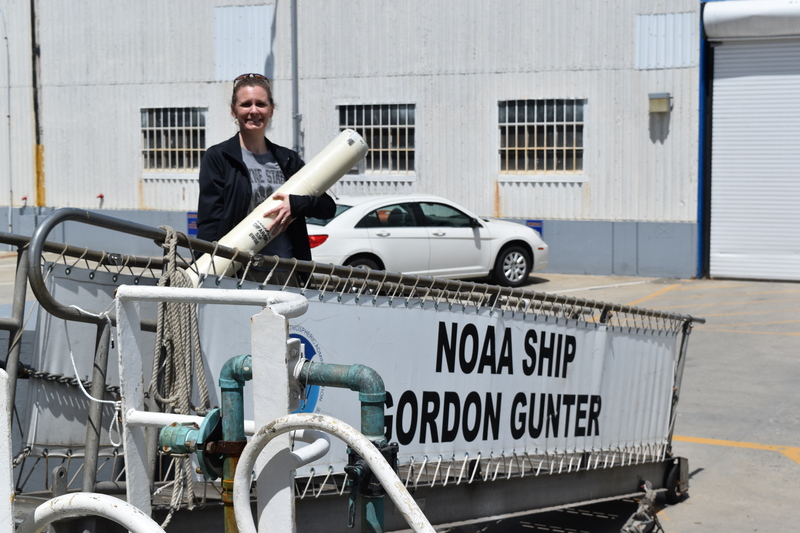 I was selected to take part in a Right Whale Survey off the Northeast Coast on board the NOAA ship the Gordon Gunter (see the ship’s website for information and photographs). I never dreamed that I would also be getting exposed to a “what could have been” experience, that is, if I had decided to study oceanography and whales 20 years ago as an undergraduate. So let me tell you a little about what I have learned so far about the North Atlantic Right Whale. The North Atlantic Right Whale (Eubalaena glacialis) is an endangered species and is protected under both the U.S Endangered Species Act and the Marine Mammal Protection Act. Right whales were heavily targeted by whale hunters, being prized for their high blubber content, the fact that they float when killed, and their relative sluggishness. They were the “right” whale to hunt. Right whales are baleen whales like the humpback whale, but feed mainly by skimming through prey at or near the surface of the ocean. Right whales are recognized by their callosities, or rough skin (white in color due to whale lice! ), on their heads. 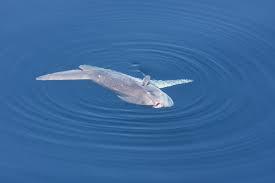 For more information on Right Whales check out the NOAA Fisheries article on them. Next week I will be flying to Boston, Massachusetts and meeting up with the Gordon Gunter at the Woods Hole Oceanographic Institute. But before then, I have to finish off the semester, participate at the WSC graduation, put in my garden (hopefully), and pack for my trip. The next time you should hear from me, I should be aboard the Gordon Gunter. Map indicating where I live/work and where I will be leaving from for the Right Whale Survey. In case you’re wondering if you got the math right, here’s the answer to the volume of water that flowed through the each bongo net (3/29 post): 282.88 cubic meters. Your answer might vary slightly if you rounded off to fewer decimal places. The answer to the math problem of 4/1: you can see 162.86 square nautical miles from the bridge. That’s a big area! As I finish writing this blog, I am still on the Gunter, in port. We got in this morning, and spent a few hours unloading. All of the science gear had to come off the ship. 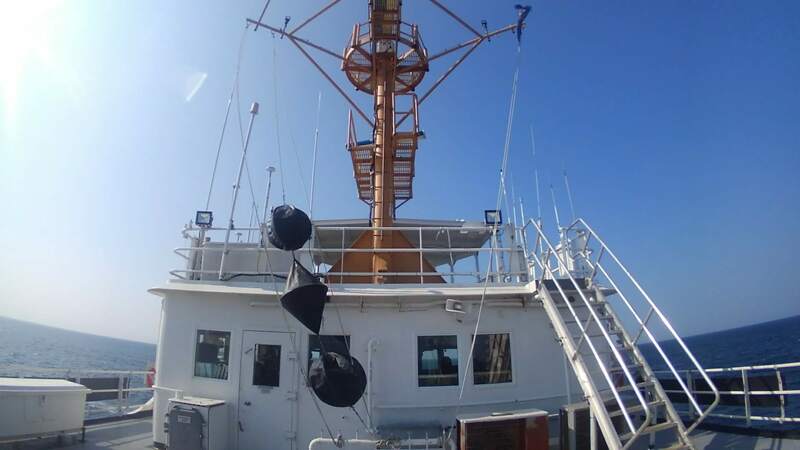 The next plankton cruise will not be on the Gunter, as she is headed north in a couple of weeks, up the east coast to New England, where she will be employed on a marine mammal research cruise. The Gunter will be in almost continuous use until late summer; that’s the next time the crew will get a break. An oil tanker; a common sight on this trip, but not usually this close! ENS Dave Wang is constantly reading our angle, and giving orders to the officers inside the bridge who are controlling the bow thruster, while XO and CO look on. Docking is a slow process. The tugboat pushes the stern, and the bow thruster moves the bow, so the ship comes in sideways, ever so slowly. The crane lowers the gangway in place. There are two of these massive “extension cords” that supply power to the ship while in port. One of the engineers hooking up one of two “extension cords” to bring power while in port. Kim and Pam watch one of the science tables being lifted by the crane. Chief Bosn Jerome is hard to catch on film as he is never standing still! When we went back to the NOAA lab to unload our gear, I got another tour of the lab, and the sorting work that is being done there. One of the main projects going on now is a project for NRDA (Natural Resources Damage Assessment) project. NRDA is a department of NOAA. This project started after the BP oil spill in 2010 to study the effects of the spill on aquatic organisms, using SEAMAP data. The samples they are analyzing are from 2010 and 2011. 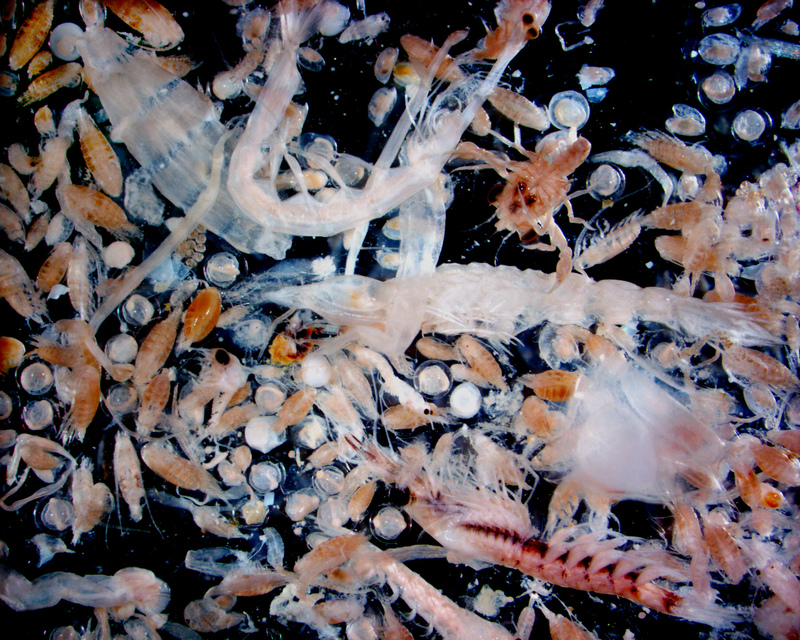 Not only do they separate the plankton, but they are very good at identifying them! This is Jennifer McDonald. I got to see some cool fish eggs and larvae from the NRDA samples, and saw some enlarged pictures from the microscope projected onto a monitor. However, I am not allowed to share them with you on this blog because of the upcoming litigation with the BP case. None of the NRDA data, photos, or anything are allowed to be shared until the court case is all over. I ventured that once it is over, there must be a lot of researchers waiting to get hold of the data, and was told that they are lining up! So if you are interested in marine science, there are definitely some research opportunities for you in the future! I wanted to describe a couple more interesting tidbits. I didn’t get to know the engineers, and wasn’t able to get a tour of the engine room, but I still want to thank them for getting us where we needed to go! The Gunter is a diesel electric ship. There are four generators (plus a backup) that create electricity to turn the two propellers. Usually, we are using three of them. They also generate our electricity. Not only that, but the waste heat from the generators is used to distill salt water to make fresh water. There is a brominator that is used to help purify the water, along with some chlorine I believe – neither of which I could detect in the water. There are regular tests for bromine and chlorine in the water. The salt goes out with the outflow, back into the ocean. And where does human waste go on a ship? Surely you must be wondering! If we are at least 12 miles from shore, it is discharged into the ocean, after being treated in some way (no chemicals). Food waste is thrown overboard, if we are at least 12 miles from shore. All food waste that is thrown over is measured and recorded (by the gallon). There are rules like this for organic wastes and other types of waste, specifying how far from shore they can be released. These rules clearly state that nowhere in any ocean is plastic allowed to be dumped. The ocean has enough plastic already, thanks to us. I want to thank the wonderful science team on this trip, for patiently teaching me the ropes and putting up with my unlimited questions. It is because of their knowledge that I was able to share the science work that we are doing. Likewise, thanks to the NOAA Corps officers who welcomed me and my questions on the bridge. And Jerome and the deck crew as well. Here’s a little bit about our scientists. Madalyn is a native to Mississippi. 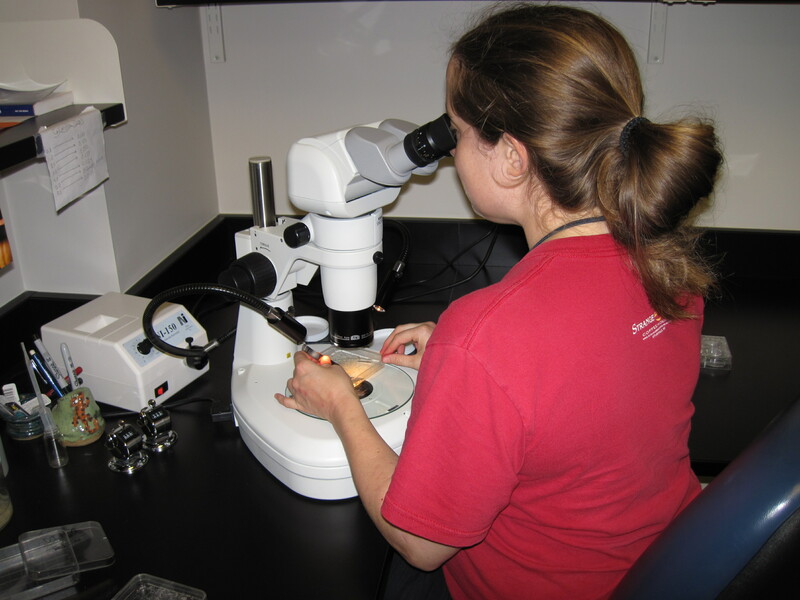 She got a degree in marine science at the University of Southern Mississippi, and started working with plankton with the Gulf Coast Research Lab (GCRL), a facility with USM. Since December, she has worked in the plankton lab at NOAA, on the NRDA project described above. If she hadn’t just gotten off the ship after working 17 days straight, she would have been at one of the microscopes in the lab when I walked through. Madalyn lives in Gulfport, MS.
Andy comes from Massachusetts, but now lives here in Ocean Springs, MS, with his wife. He has worked in the plankton unit for five years now, having started in plankton in college. (My question to everyone was, “So how long have you been in plankton?”) Andy has a BS in marine biology, and a MS in marine science. 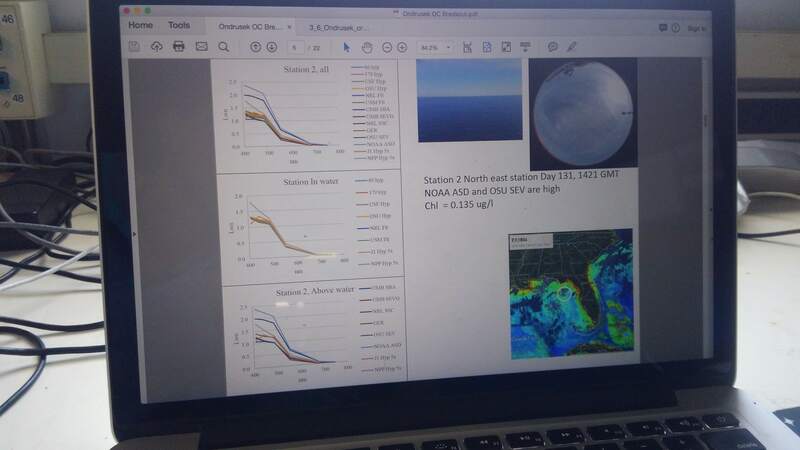 For his graduate work, he used SEAMAP data from the CUFES samples, studying community structure of invertebrates throughout the Gulf, and how they are affected by abiotic factors (such as temperature and salinity). This was interesting to me, because there is so much data available, and many options to analyze that data in new ways. Science doesn’t always mean you need to collect your own data! (See my note about the NRDA data above.) So now Andy specializes in invertebrate data analysis, using the data we collect. He is the FPC (Field Party Chief) for the spring and fall plankton research cruises this year. He and Pam take turns with that role. Kim comes from Texas, and started with NOAA in 2001. She got a degree in marine fisheries, and through NOAA, was able to get her masters just a few years ago. NOAA offers nice opportunities for continuing education. Kim’s main focus is the juvenile fish – the size up from what we are working with here. They do summer groundfish surveys, which involve trawling. They catch things like commercial shrimp (that go down to the bottom at night), as well as snappers that hang out at the bottom. Kim will also be very busy at sea this year, and somehow even finds time for her husband and four young children! Pam, our humble, kind, and intrepid leader, grew up in the Midwest, and has been “in plankton” for 23 years now! 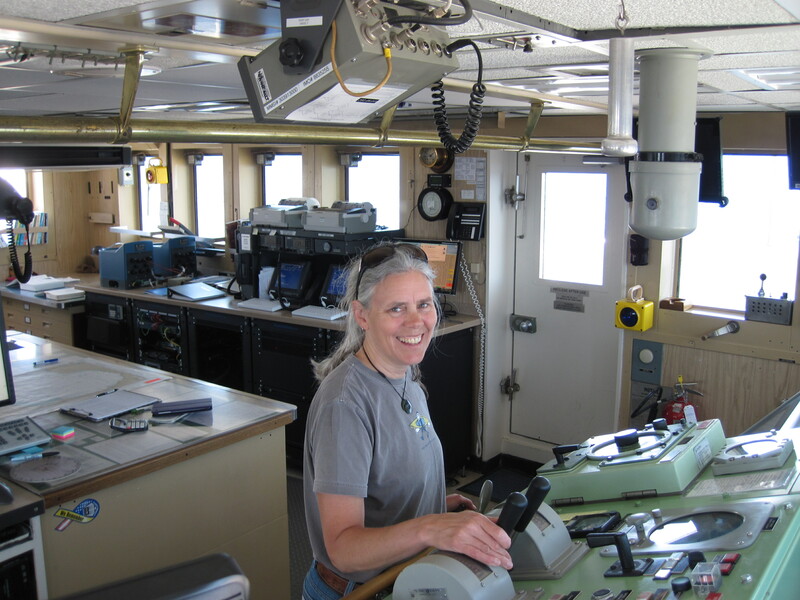 She started as a volunteer at GCRL, got hired, and spent 7 years working there before joining NOAA in 1999. I should clarify that GCRL, and several other facilities, are all part of SEAMAP, which is a cooperative project. Pam has been an FPC since 2001, as she puts it, “since the days of DOS and data sheets.” Can you imagine manually entering all your data into the computer data base?! She lives with two cats and her husband, also a federal employee with the USDA chemistry lab, in Wiggins, MS.
(Update on 4/3) – After I arrived too late at the airport this morning and missed my flight out, Pam felt so bad that she took me out to lunch and gave me a tour of the Hurricane Katrina aftermath along the coast. She was worried that I would say bad things about her on the blog post, but I still have nothing but good things to say, Pam, if you are reading this! You are awesome! I learned a bit about how all this goes together. We have the plankton surveys, which you know about. We have the groundfish surveys, which are done by trawling (dragging a net over the bottom). That catches the juveniles, but the adults tend to outswim the net. So then we have the longline surveys to catch the adult (pelagic) fish. In a sense, we are using the same techniques commercial fishermen do, in order to study the health of the species throughout the stages of development. When plankton research started, it was all about learning as much as possible about individual species. Now (and if you check out the NOAA FishWatch website you will understand this better), all of the data becomes important. We know that for a successful fishery, we need a healthy and diverse ecosystem. The information about non-economically important species is crucial to understanding the entire community, as well as the information about abiotic (physical) factors such as the CTD provides. I find this focus encouraging; I feel we are learning something as we try to “manage” these incredible resources. The more we understand the big picture, the more we can take care of our precious Earth. Would I do this again? Absolutely! I learned so much! Important things like why NOAA only allows shoes with closed toes on their ships (I would have stubbed my toes a thousand times!). I learned that flying fish and mano’wars are some of the most bizarre creatures at the surface of the ocean. I learned that I’m still not so sure about the seasickness thing. There were days that were spent in a very sleepy, off-feeling mode. I need more research on that! I learned that there’s a lot going on out on our oceans that we are unaware of, like why was that oil rig that we passed the other night on fire, and has anybody reported it? And I learned that there is so very, very much more to learn. Our world is so fascinating! Never stop wondering. Thanks for following along! April Fools! (sorry, couldn’t resist) The biggest squid we’ve caught are about a half inch long. Image from http://www.factzoo.com/. Let’s talk about something just as exciting – navigation. I visit the bridge often and find it all very interesting, so I got a 30 minute crash course on navigation. We joked that with 30 minutes of training, yes, we would be crashing! From the bridge, you can see a long way in any direction. The visible range of a human eye in good conditions is 10 miles. Because the earth is curved, we can’t see that far. There is a cool little formula to figure out how far you can see. You take the square root of your “height of eye” above sea level, and multiply that by 1.17. That gives you the nautical miles that you can see. So the bridge is 36 feet up. “Really?” I asked Dave. He said, “Here, I’ll show you,” and took out a tape measure. 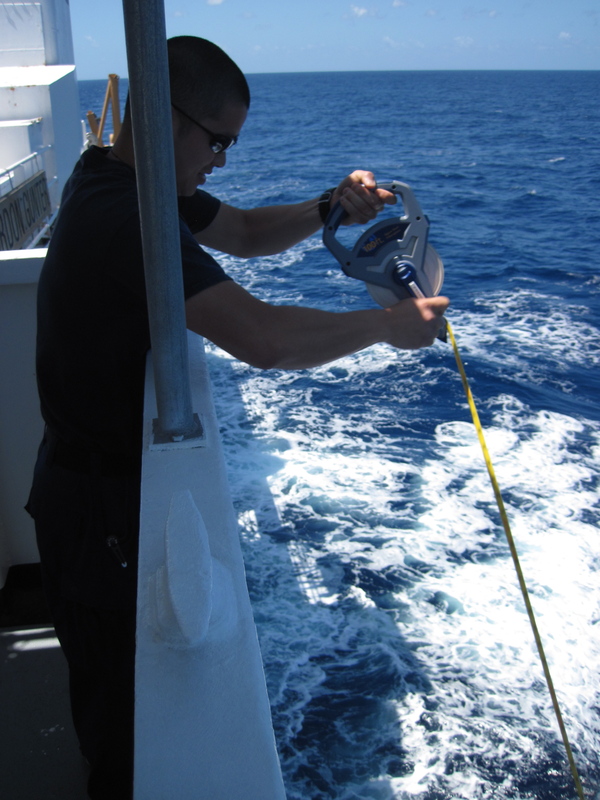 ENS Dave Wang measuring the height of the bridge above sea level. OK, 36 feet it is, to the rail. Add a couple of feet to get to eye level. 38 feet. Square root of 38 x 1.17, and there we have it: 7.2 nautical miles. That is 8.3 statute miles (the “mile” we are used to using). That’s assuming you are looking at something right at sea level – say, a giant squid at the surface. If something is sticking up from sea level, like a boat, that changes everything. And believe me, there are tables and charts to figure all that out. Last night the bridge watch saw a ship’s light that was 26 miles away! The light on our ship is at 76 feet, so they might have been able to see us as well. If you can see 7.2 nautical miles in any direction, what is the total area of the field of view? It’s a really amazing number! 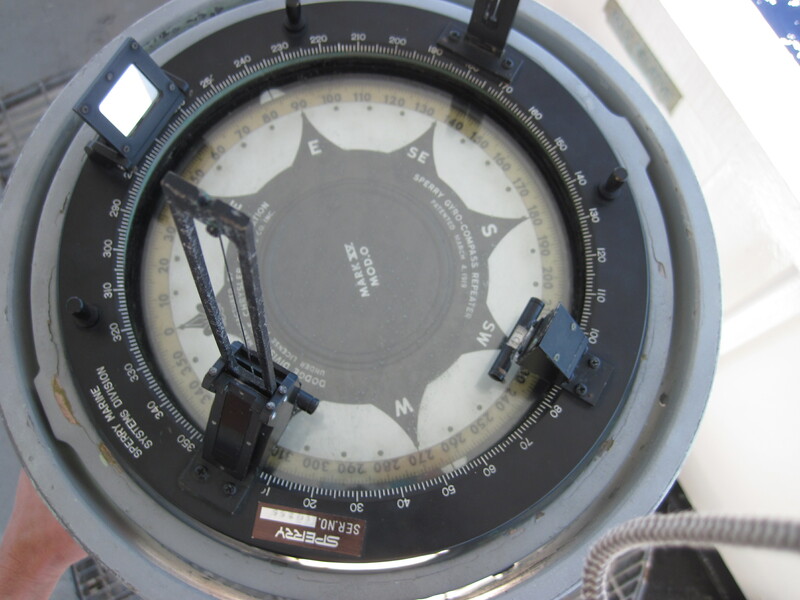 Below are some photos of the navigation charts. 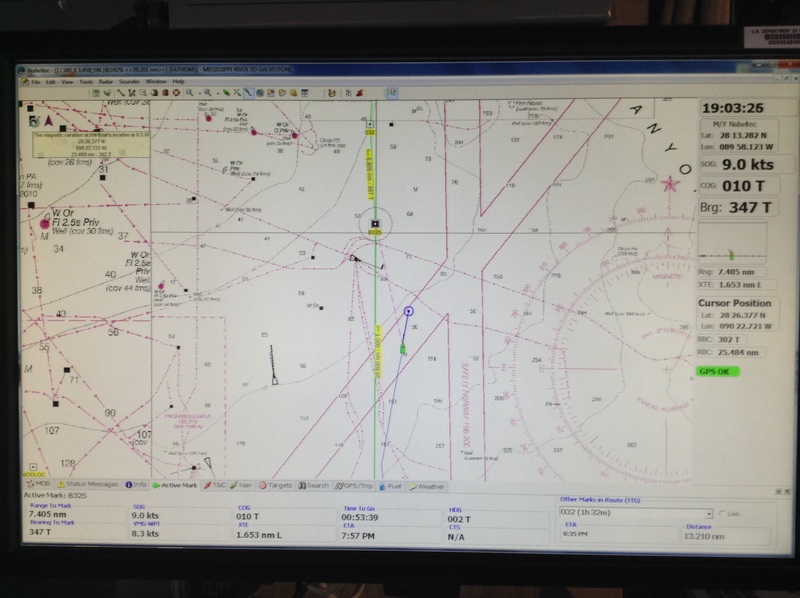 They can be zoomed in or out, and the officers use the computer to chart the course. You can see us on the chart – the little green boat. This is a chart zoomed in. The green boat (center) is us, and the blue line and dot is our heading. In the chart above, you’ll see that we seem to be off course. Why? Most likely because of that other ship that is headed our direction. We talk to them over the radio to get their intentions, and reroute our course accordingly. Notice the left side, where it says “dump site (discontinued) organochlorine waste. There are a lot of these type dump sites in the Gulf. Just part of the huge impact humans have had on our oceans. Here is the setup for the station. The plan is that we will be moving south, probably into the wind, during the sampling. See the north-south line? How do those other ships appear on the chart? 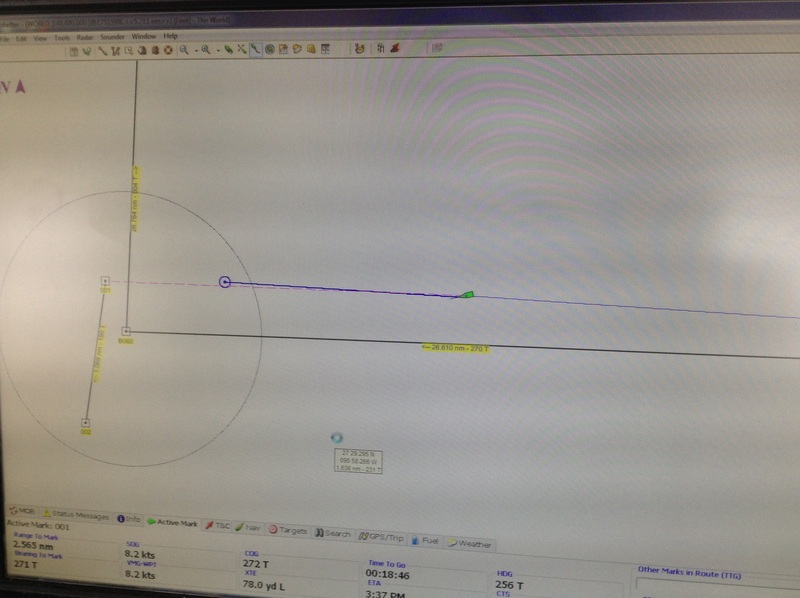 This is through input from the AIS (Automated Information System), through which we can know all about other ships. 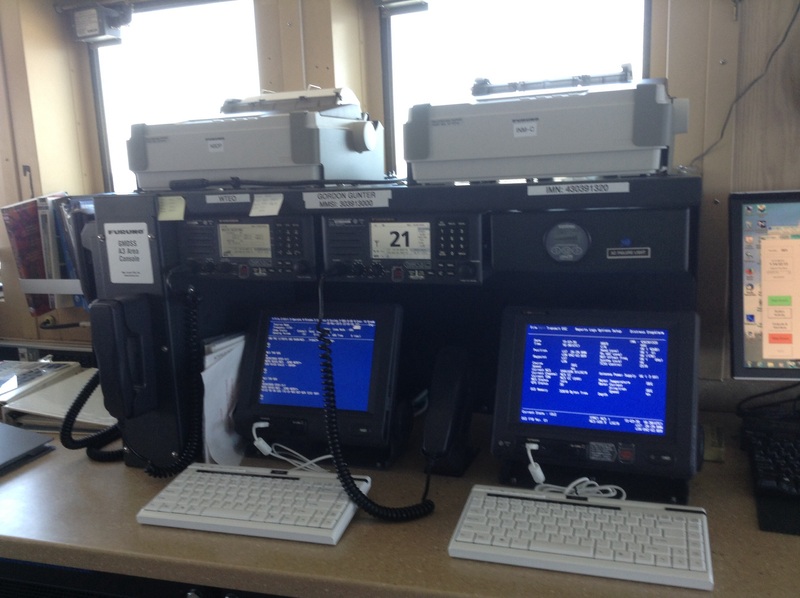 It broadcasts their information over VHF radio waves. We know their name, purpose, size, direction, speed, etc. Using this and the radar system, we can plan which heading to take to give the one-mile distance that is required according to ship rules. 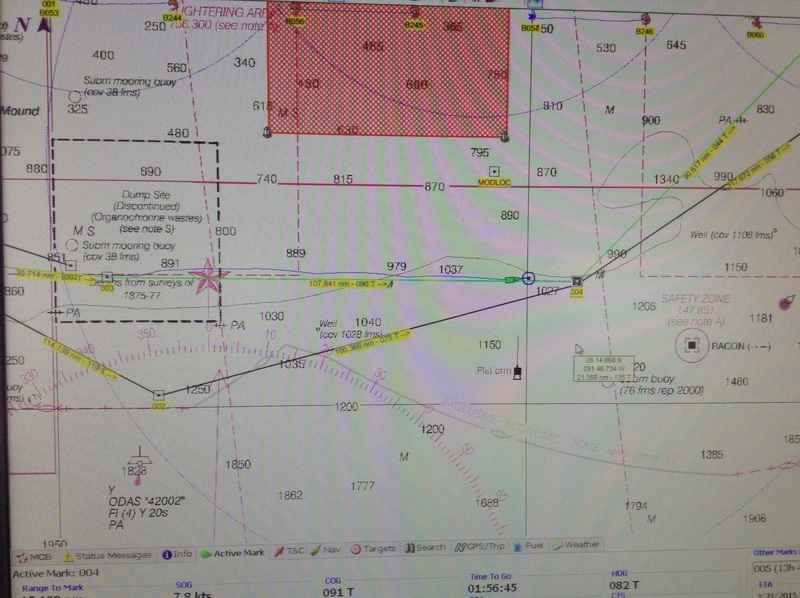 As a backup to the computer navigation system, every half hour, our coordinates are written on the (real paper) navigation chart, by hand. ENS Pete Gleichauf is writing our coordinates on the paper navigation chart. 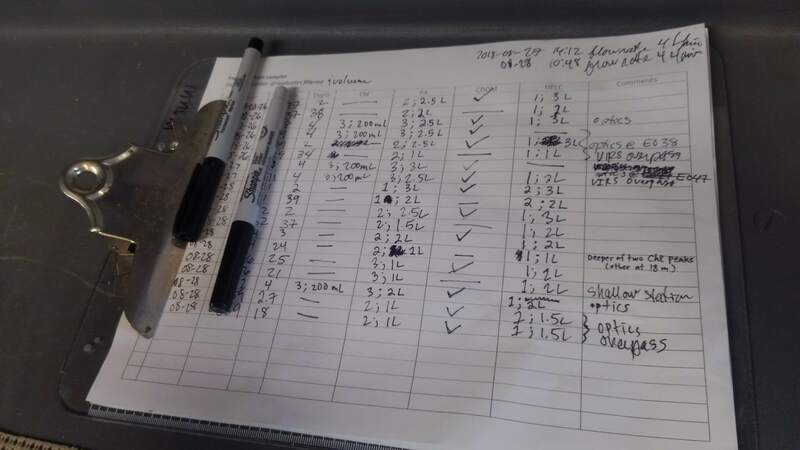 There are drawers full of charts for everywhere the Gunter travels! 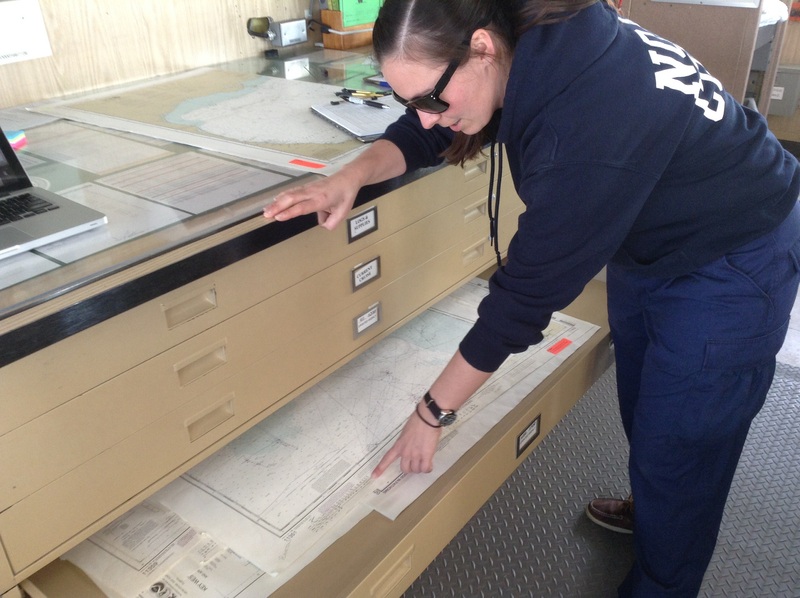 ENS Melissa Mathes showing me where all the navigation charts are kept. Remember, these are just backups! Below is our radar screen. There are 3 other ships on the screen right now. 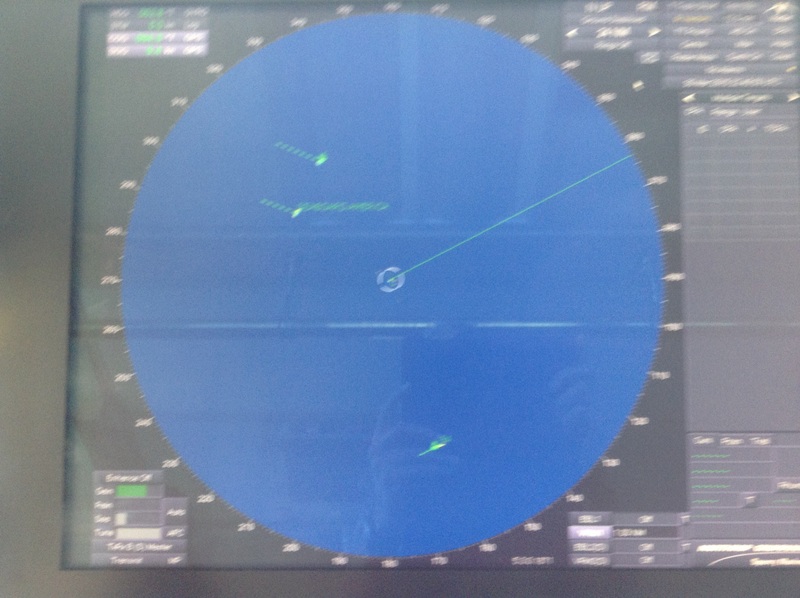 The radar computer tells us the other vessels’ bearing and speed, and how close they will get to us if we both maintain our course and speed. The other vessels in the area, and their bearing, show up on the radar. If the radar goes down, the officers know how to plot all this on paper. 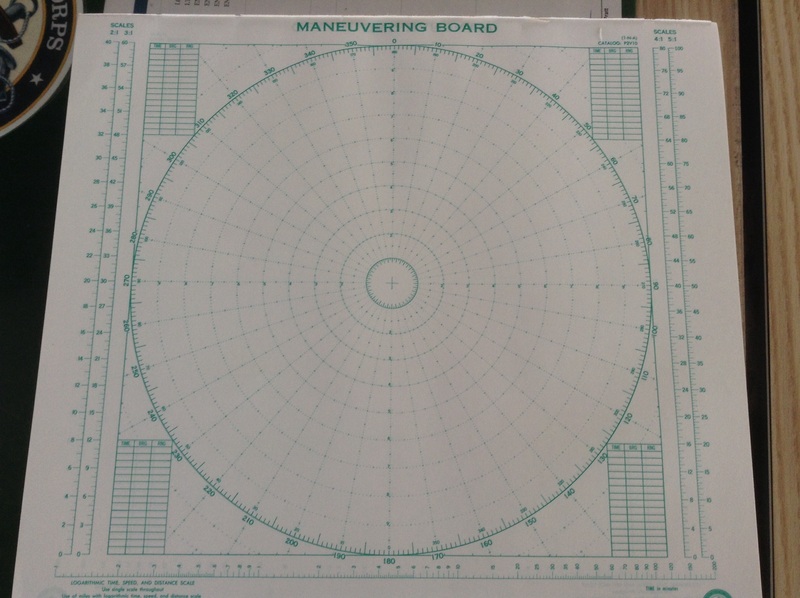 On this maneuvering board, officers are trained to plot relative positions just like the radar computer does. Below is Dave showing me the rudder controls. The rudder is set to correct course automatically. It has a weather adjustment knob on it. If the weather is rough (wind, waves, current), the knob can allow for more rudder correction to stay on course. So when do they touch the wheel? To make big adjustments when at station, or doing course changes. Dave’s arm – showing me the rudder controls. These are the propulsion control throttles – one for each propeller. They control the propeller speed (in other words, the ship’s speed). Here are the throttles that control the engine power, which translates to propeller speed. 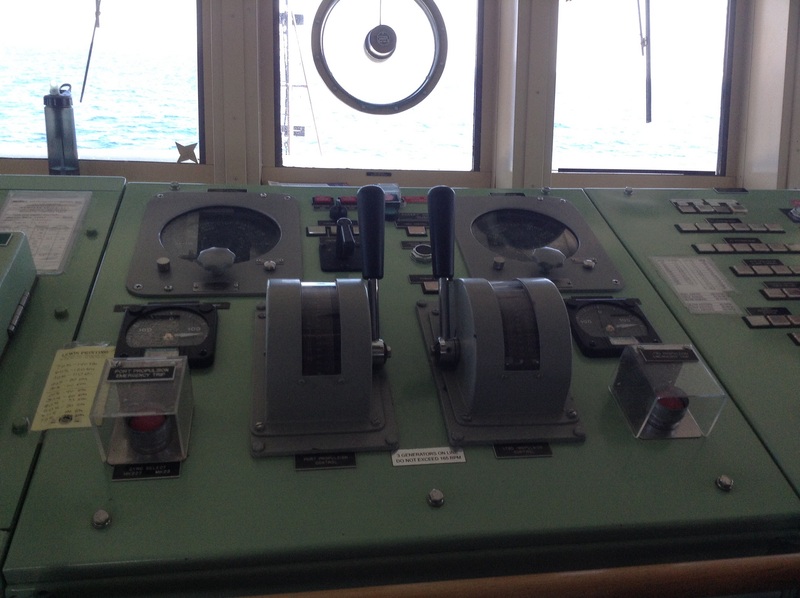 This controls the bow thruster, which is never used except in really tight situations, such as in port. It moves the bow either direction. And below is the Global Maritime Distress and Safety System (GMDSS). It prints out any nautical distress signal that is happening anywhere in the world! And then, of course, there is a regular computer, which is usually showing the ships stats, and is connected to the network of computers throughout the ship. ENS Kristin Johns checking the weather system coming our way. In my post of March 17, I described the gyrocompass. 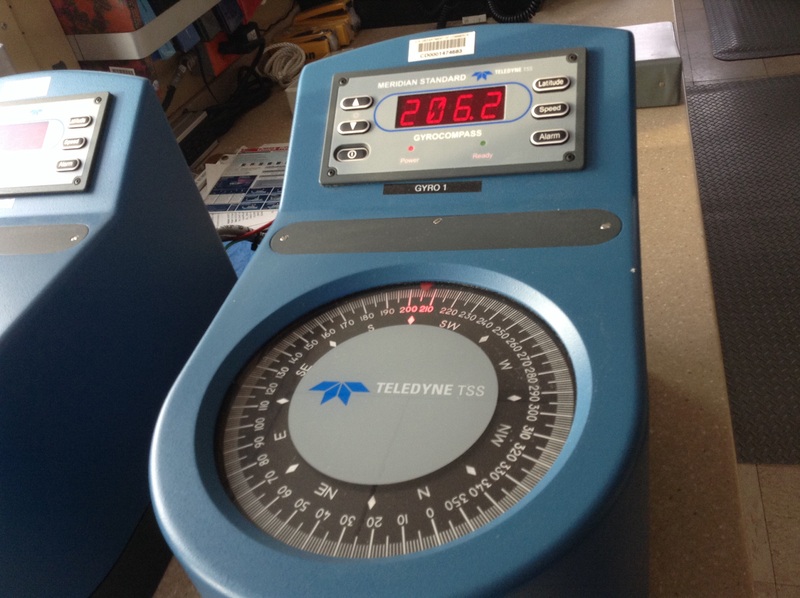 That is what we use to determine direction, and here is a rather non-exciting picture of this very important tool. This is the gyrocompass, which uses the rotation of the Earth to determine true north. This is called the alidade. Using the position of the sun as it rises or sets, the gyro error can be computed and used to keep our heading perfectly accurate. The math for calculating gyro error isn’t hard; it just takes many steps and careful following of instructions! Knowing how to read charts and tables is important! You can see that we have manual backups for everything having to do with navigation. We won’t get lost, and we’ll always know where we are! These past two days, we have been in transit, so no sampling has been done. But here are a couple more cool micrographs of plankton that Pam shared with me. Our main fish of interest in the winter plankton sampling are the groupers. There are two main species: gag groupers and red groupers. You can learn all about them on the NOAA FishWatch Website. Groupers grow slowly and live a long time. Interestingly, some change from female to male after about seven years – they are protogynous hermaphrodites. In the spring plankton research cruise, which goes out for all of May, the main species of interest is the Atlantic bluefin tuna. This species can reach 13 feet long and 2000 lbs, and females produce 10 million eggs a year! 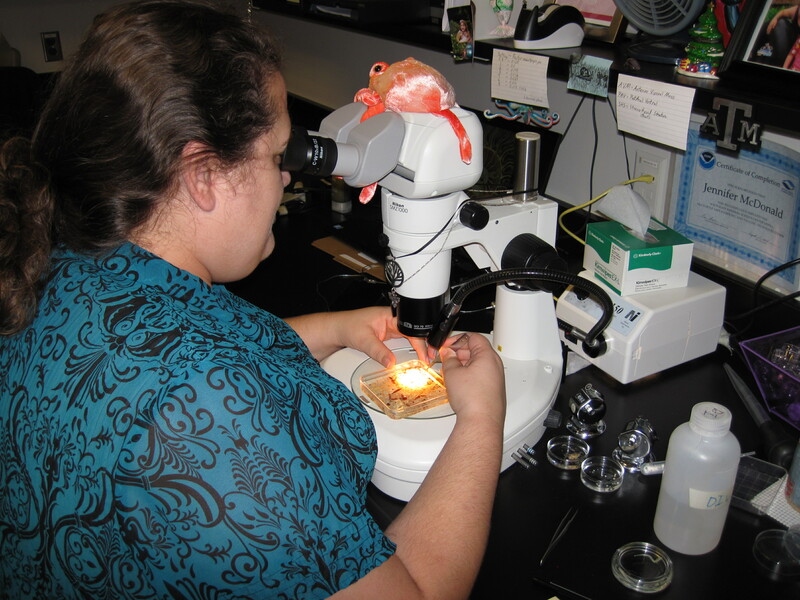 The fall plankton research focuses on red snapper. These grow up to about 50 pounds and live a long time. You can see from the map of their habitat that it is right along the continental shelf where the sampling stations are. The NOAA FishWatch website is a fantastic resource, not only to learn about the biology, but about how they are managed and the history of each fishery. I encourage you to look around. You can see that all three of these fish groups have been overfished, and because of careful management, and research such as what we are doing, the stocks are recovering – still a long way from what they were 50 years ago, but improving. 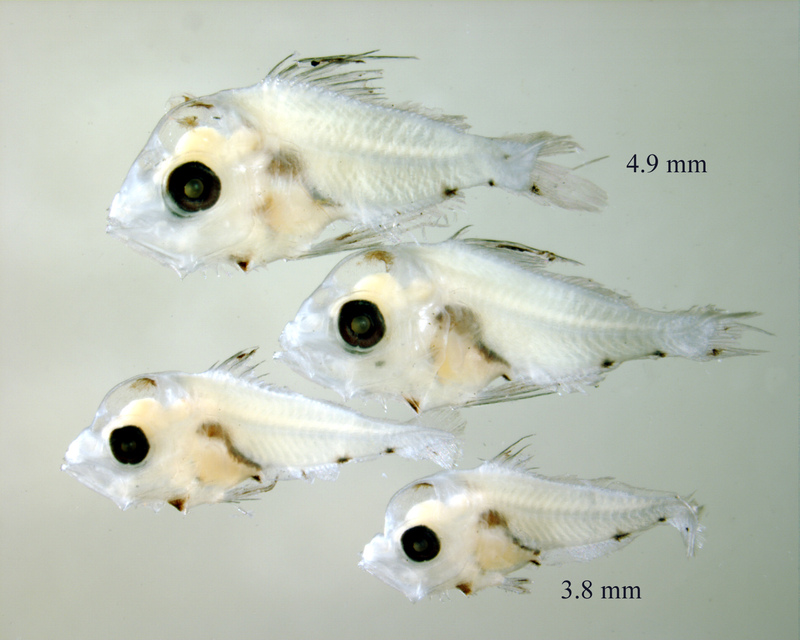 I had a good question come in: how long before the fish larvae are adults? Well, fish are interesting creatures; they are dependent on the conditions of their environment to grow. Unlike us, fish will grow throughout their life! Have you ever kept goldfish in an aquarium or goldfish bowl? They only grow an inch or two long, right? If you put them in an outdoor pond, you’ll see that they will grow much larger, about six inches! It all depends on the environment (combined with genetics). “Adult” generally means that they are old enough to reproduce. That will vary by species, but with groupers, it is around 4 years. They spawn in the winter, and will remain larvae for much longer than other fish, because of the cooler water. This is the bridge deck – inside those windows are where most of the pictures on this post were taken. The flying bridge is above. This is looking forward (and very far down) from the flying bridge toward the bow. My favorite part of the ship – the flying bridge. It’s the highest and a wonderful place for an afternoon nap or to read a book. We have a small gym on board with an elliptical, treadmill, bike, free weights, a rowing machine, and other goodies. I use it often – I like to do the hill climb on the treadmill or ride the bike. What is the difference between a nautical mile and a statute mile? How about a knot? Do you know what I mean when I say “invertebrate?” It is an animal without a backbone. Shrimp and crabs, are invertebrates; we are vertebrates!